It was a tale of 2nd places for Dover Rowing Club at Herne Bay Regatta. 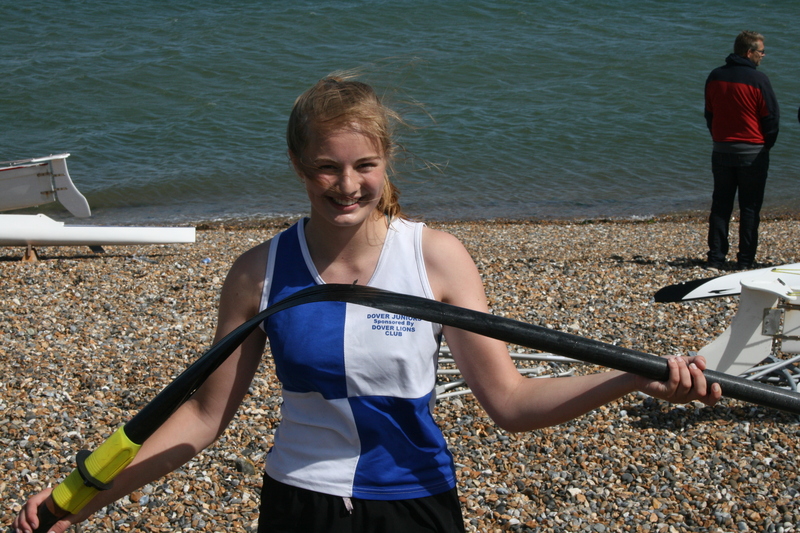 Ladies J16 Quad Sculls crew of Rebecca Stothart, Morgan Evans, Ella Day, Jade Jordon coxed by Tony Burrows had a challenging race after Day caught a crab early shattering her blade shaft and trapping it under their boat. 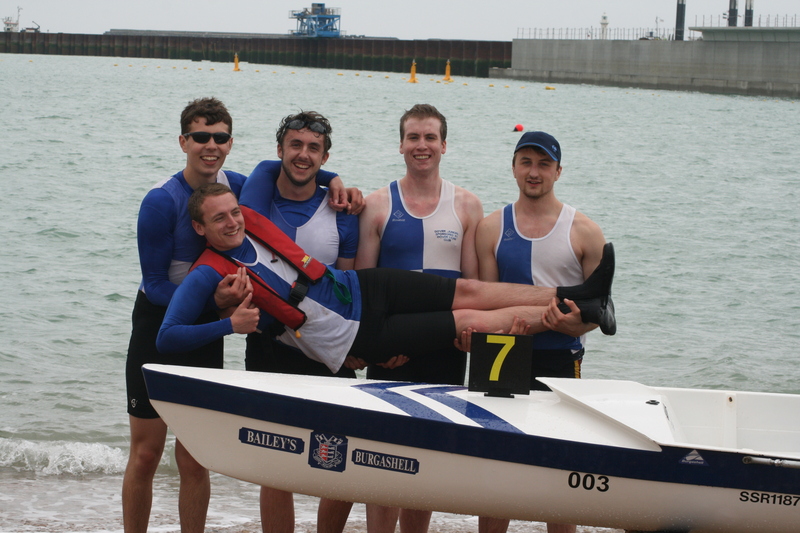 Despite the handicap the young crew fought on and held on to take 2nd place at the line. 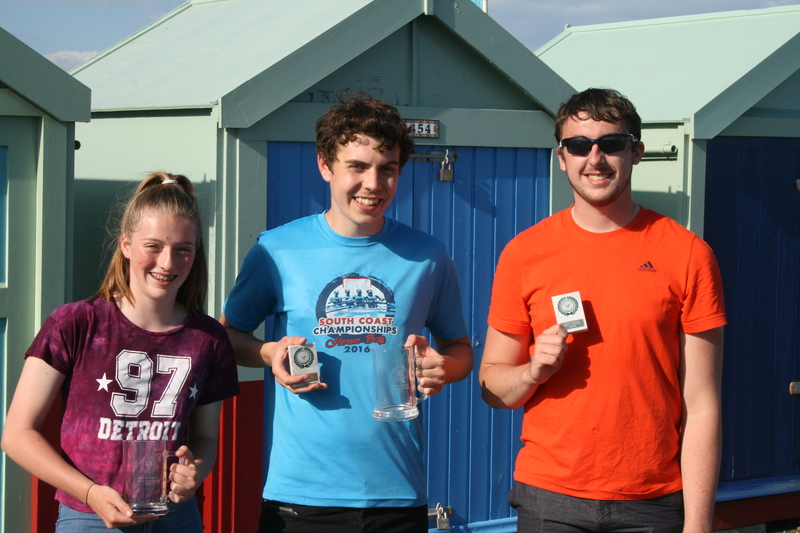 The Men’s Junior Pairs saw Chris Hall and Tom Stothart get off to a strong start in pursuit of the Herne Bay pair that has dominated the competition this season. They reached the turn with a narrow lead before coming out level, but Dover fell to 2nd by the last 500m and came home in the runners up spot. The Men’s Junior Sculls saw Hall and Chris Price competing. 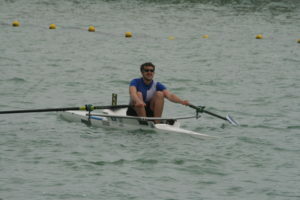 Hall in the less favoured outside lane got a great start and was in the mix with the lead scullers. Price had a steadier start in the rough conditions. 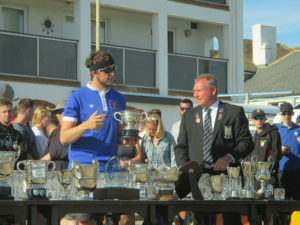 Hall followed Herne Bay’s former World Champion around the inside turn, and applied pressure on him in the rough conditions in the final quarter, but was unable to pass taking 2nd. Price came home in 7th. 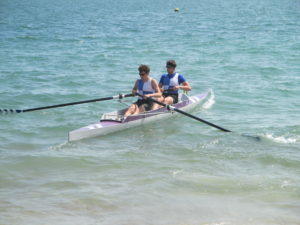 The results of the Junior Pairs and Sculls were sufficient to take 2nd place in the Men’s Junior Aggregate competition. 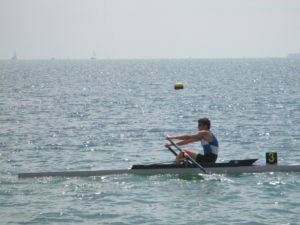 The Men’s Novice Fours saw Nathan Peach competing with an Eastbourne crew coxed by Paul Scrivener, and Jon Cook with a Worthing crew. Peach’s crew led into the turn but struggled to make a clean turn coming out 2nd with Cook’s crew 3rd. 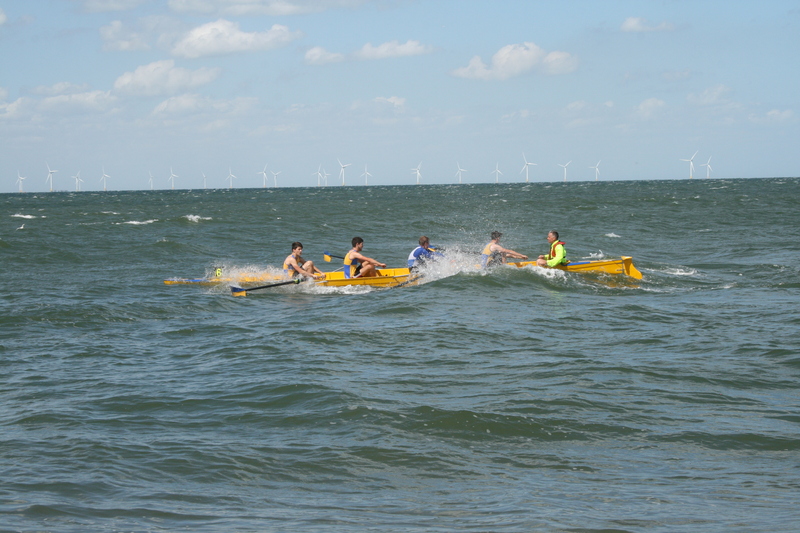 In the last 500m the conditions deteriorated but Peach’s crew cleared the worst of it and secured 2nd. 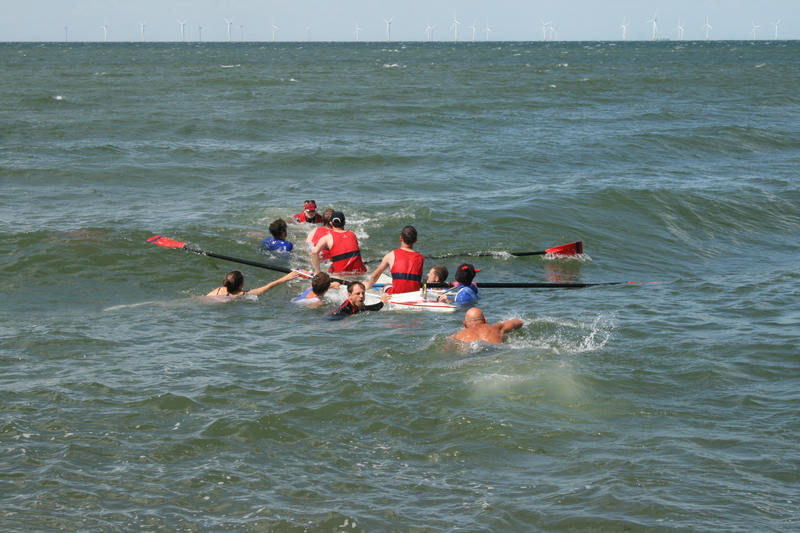 Cook’s boat was swamped resulting in Dover rowers swimming out to help land the stricken boat and crew. 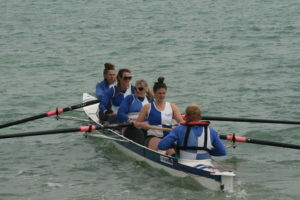 The Ladies Novice Four saw Dover enter two crews Dover A: Jade Jordon, R Stothart, Ella Day, Evans coxed by Jo Johnston and Dover B: Newton (Eastbourne) Jamie Jordon, Kate Day, Kate Smith coxed by Scrivener. 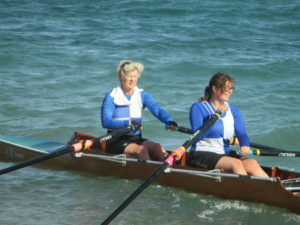 There was extra interest in this race as Dover B contained two of the mothers of the young Dover A crew. 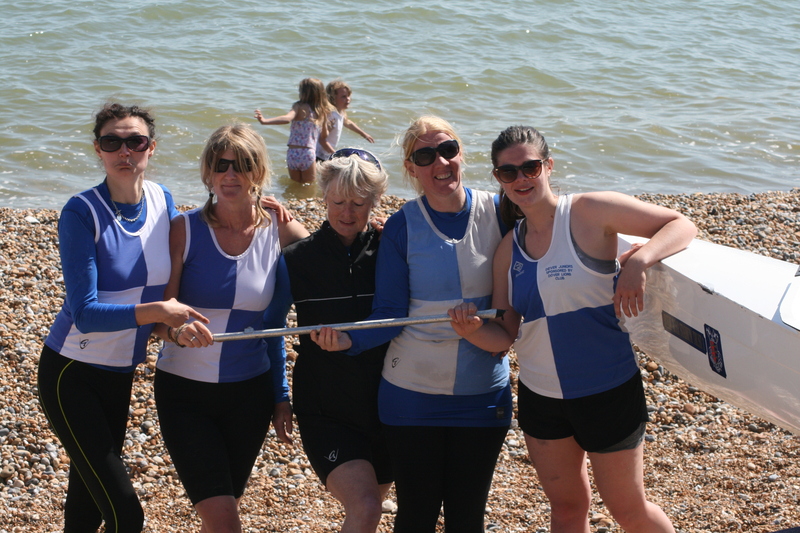 The Dover crews were locked into a neck and neck race for 3rd and 4th with the ‘Mum’s’ crew taking it by a canvas. 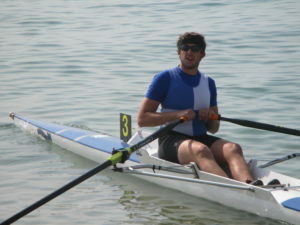 Men’s Novice Sculls saw T Stothart, Burrows and Peach competing. Stothart got off to a great start moving with the lead group whilst Burrows and Peach were fighting for the remaining points. Stothart turned in 3rd and was unable to improve his position on the run home. Burrows and Peach just missed out the points coming across the line in 7th and 8th. 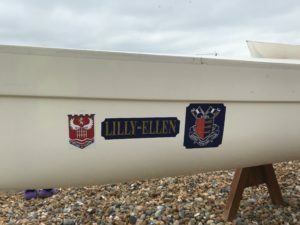 In the Ladies Sculls Johnston worked hard to run down the Worthing sculler finishing in 4th missing out on 3rd by less than a canvas. 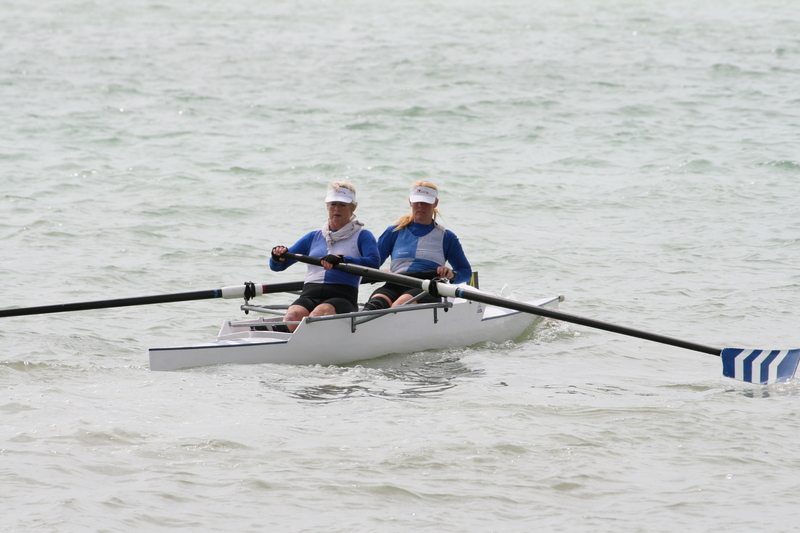 Johnston and Maria West-Burrows competed in the Senior Ladies Pairs but a slow start left them chasing the field and by the turn they were 5th. They were unable to improve their position by the finish line. Veteran 40’s saw Scrivener, Matt Barnett, Nick Bailey, Burrows coxed by Jade Jordon starting well but rudder issues saw them come home in 5th. 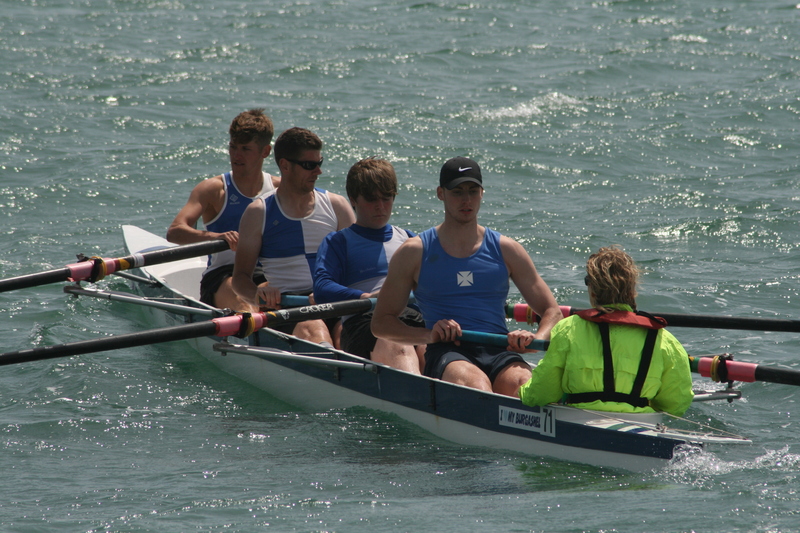 The Junior Men’s Four of Peach, Cook, Hall, T Stothart coxed by Jade Jordon finished 7th in a competitive field. 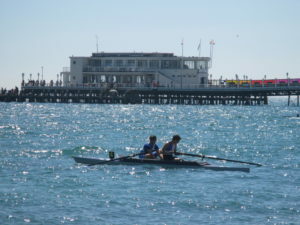 The annual coming together of CARA and Hants and Dorset ARA at Southsea, saw two Dover rowers braving the early start. 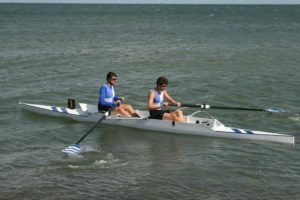 Chris Hall and Tom Stothart were met with beautiful early sea conditions for the heats that roughed up for the finals. 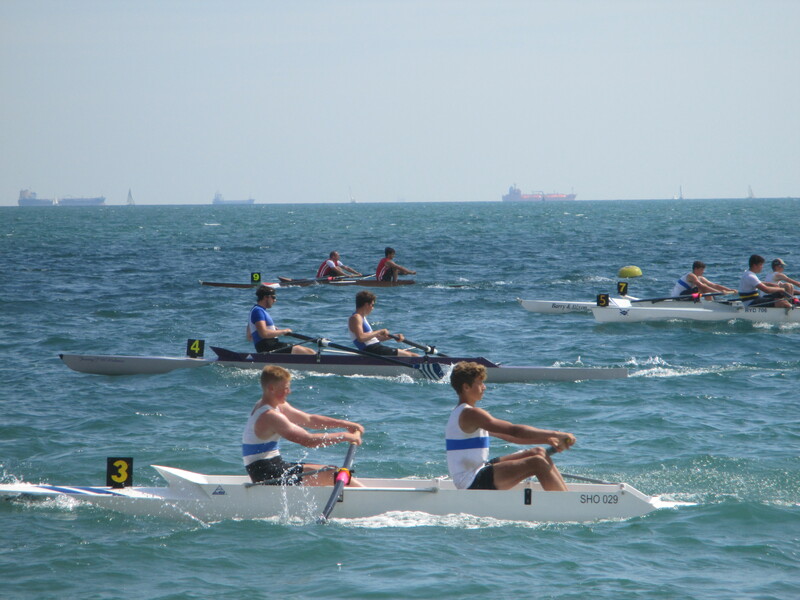 Despite racing in borrowed boats the boy’s overall results were the best Dover RC have managed in recent years at this event. 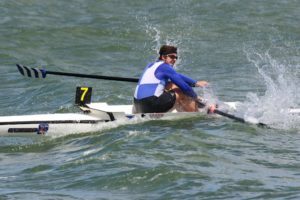 In the heats for the Men’s Pairs, Hall and Stothart had to appeal for a restart after a crash in the first few strokes stopped two boats. 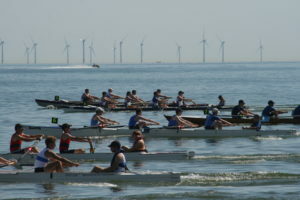 The restart saw them get off quickly, easing ahead of the field, with a comfortable lead at the turn, and they secured a place in the final by coming home in first. 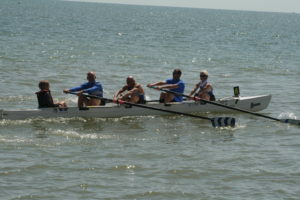 With the rougher conditions of the final pushing crews inshore, the Dover boys chose to move out from their inside draw. 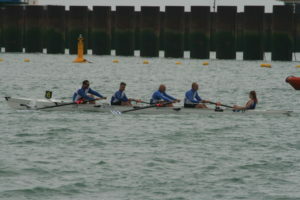 A coming together with Southsea at the three quarter point on the outside leg saw them drop to 5th at the turn. The young rowers worked hard to run down those ahead of them but by half way back they were in a three way tie for second before laying the power down to come home comfortably in the runners up spot. 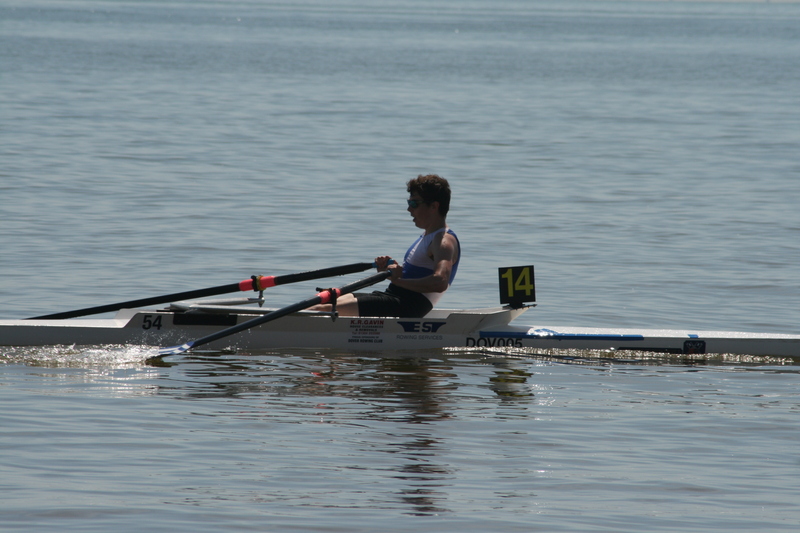 In the Junior Sculls Hall moved easily off the start and established himself in a qualifying position before dropping his rate to come home in the 4th qualifying spot. Hall moved strongly off the line and was battling the leaders. 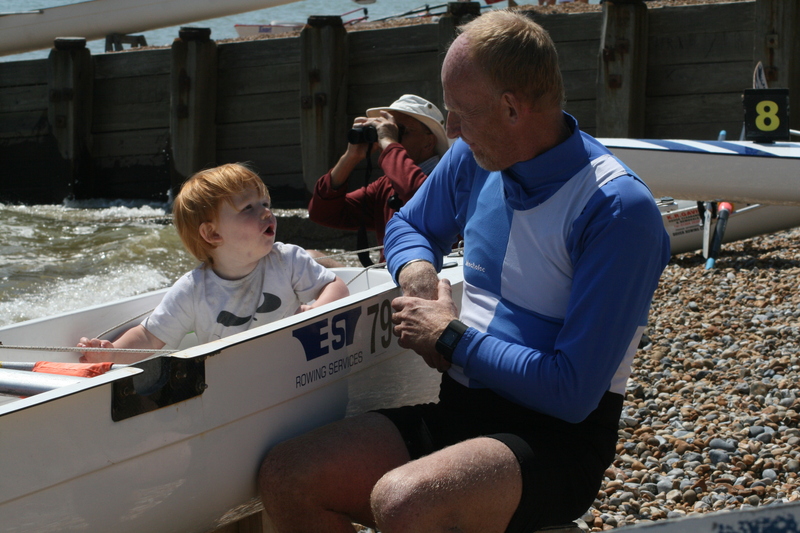 By the turn he was chasing the Bexhill rower whilst keeping an eye on the inside sculler from Deal. 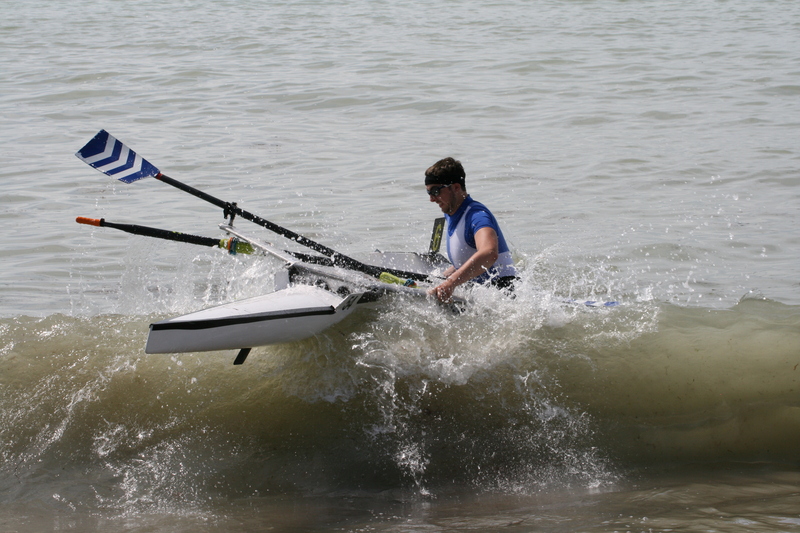 Pushing as hard as the conditions allowed Hall was unable to close the gap coming home second. Stothart competing in the Novice Sculls moved comfortably through the qualifying round coming home in 4th. 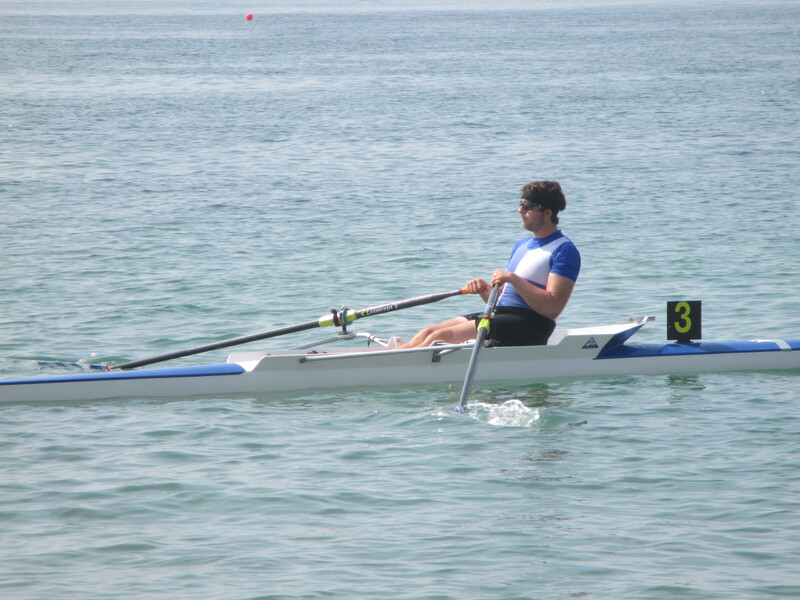 In the final Stotahrt flew off the start and had established a good lead as he approached the buoy turn. Unfortunately a terrible turn saw him come out with less than a length lead. 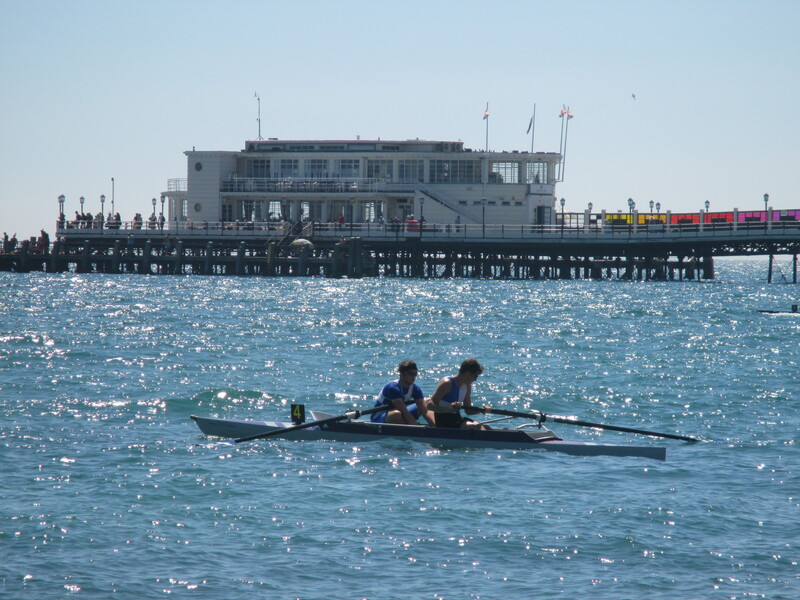 The run home saw Southsea and then two Hants and Dorset scullers come past him leaving him in fourth, the second of the CARA scullers. 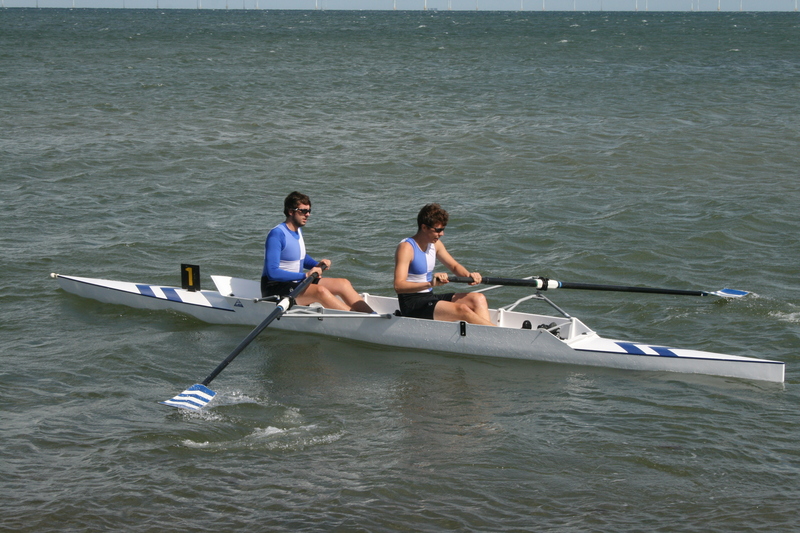 Dover RC would like to thank Deal and Herne Bay rowing clubs for lending boats to allow Hall and Stothart to compete. 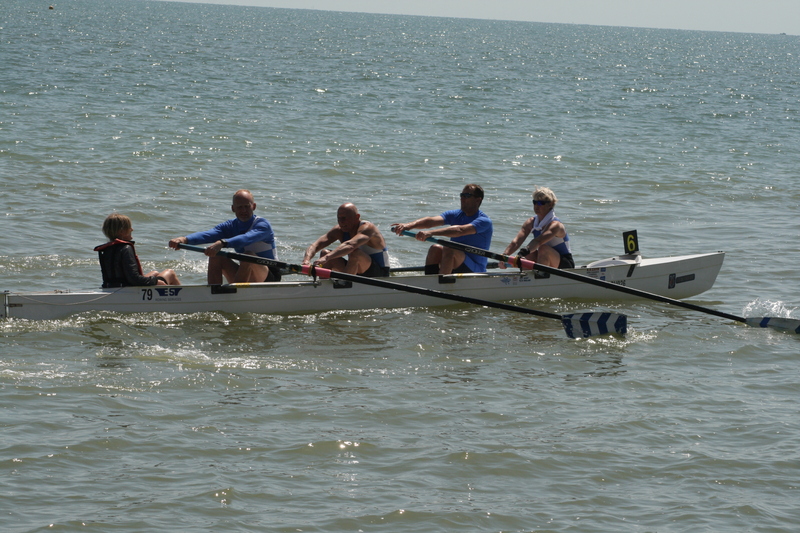 Dover Rowing Club were in action at Deal and Worthing regattas last weekend. 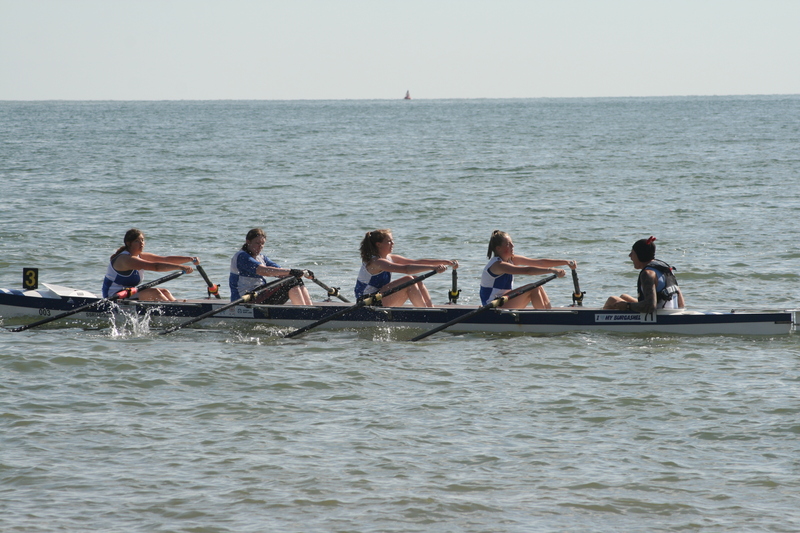 The Ladies J16 Quad of Rebecca Stothart, Chloe Bicker, Ella Day, Jade Jordon coxed by Tony Burrows got off to a good start and were quickly pursuing Herne Bay’s strong crew. 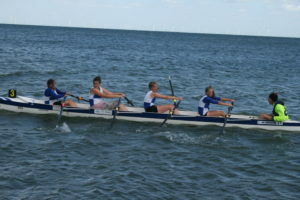 By half way the Quad were comfortably 2nd, after pulling clear of Deal, holding that position to the finish. 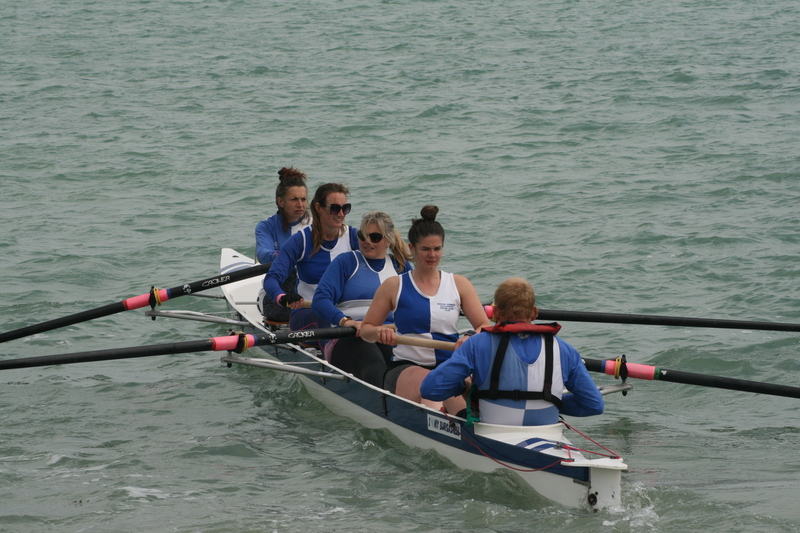 The same crew later competed in the Novice Ladies 4 alongside Dover ‘B’ crew of Antonia Reed, Sophie Wolfenden, Kate Day, Kate Smith coxed by Chrissy Purvis. 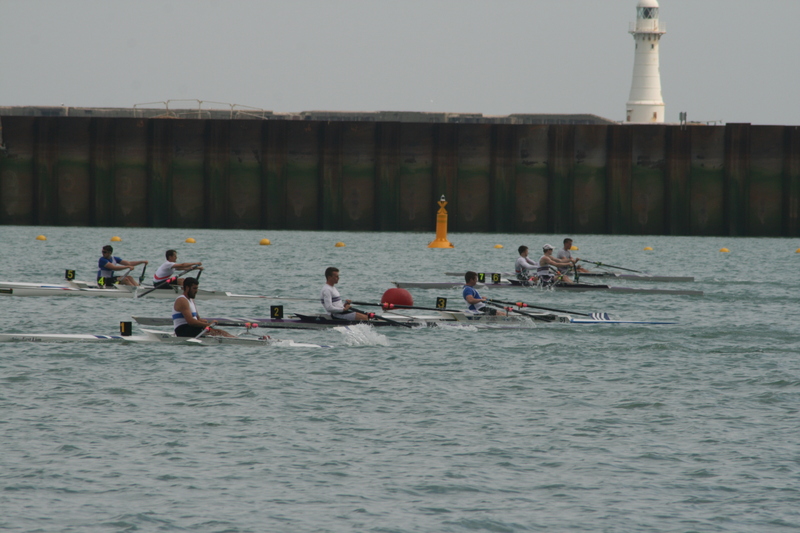 Dover ‘A’ were in the mix from the start as they headed for the first turn whilst Dover ‘B’ had a steadier start. 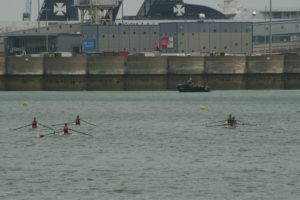 In the race for the second turn Dover ‘A’ were fighting Folkestone for 4th place. They out sprinted them to the finish to confirm 4th place, with the ‘B’ crew coming home 6th. 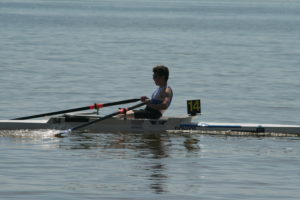 The heats for the Men’s Novice Sculls saw Tom Stothart and Nathan Peach race first. T Stothart appeared to be in contention at the half way point sitting in 4th with Peach chasing hard in 6th. At the last turn T Stothart was hit by Worthing who had tried to take his turn, stopping him dead. He would later be progressed to the final as a result. Peach finished well in 6th. Burrows found himself in a 3 way race for the last qualifying spot in his heat, he regained 4th after a excellent last turn but positions changed repeatedly before the finish with Burrows missing out. In a less dramatic final T Stothart secured 3rd place. T Stothart was one of two Dover rowers at Worthing, he qualified for the Men’s Novice final by winning his heat. 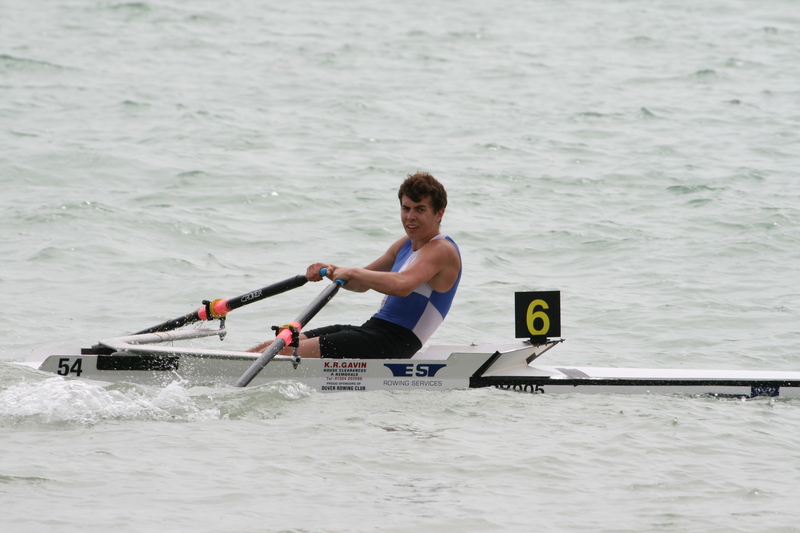 In the final T Stothart found himself in a three way battle for second from the buoy turn. It was neck and neck until, with 10 strokes to go, T Stothart had second only to catch a crab dropping him to 4th. Chris Hall competed at both Deal and Worthing in the Men’s Junior Sculls. Hall held 3rd at the first turn at Deal and was unable to improve by the finish. At Worthing Hall was only able to take 4th from the outside lane. 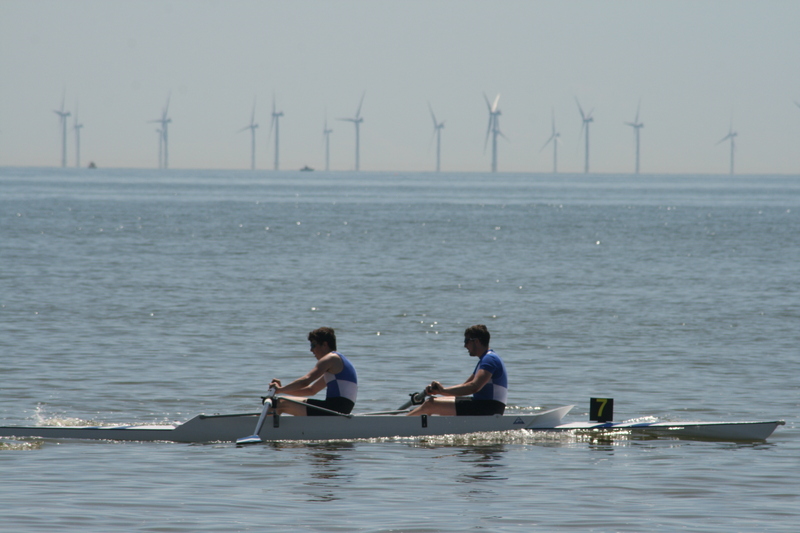 Hall and Stothart combined in the Men’s Junior Pairs, at Deal the boys found themselves in the lead after three boats tangled dropping to second on a bad turn. Comfortably in second the Dover Pair were crashed into at the second turn dropping them to 4th, the same position they were to take at Worthing. 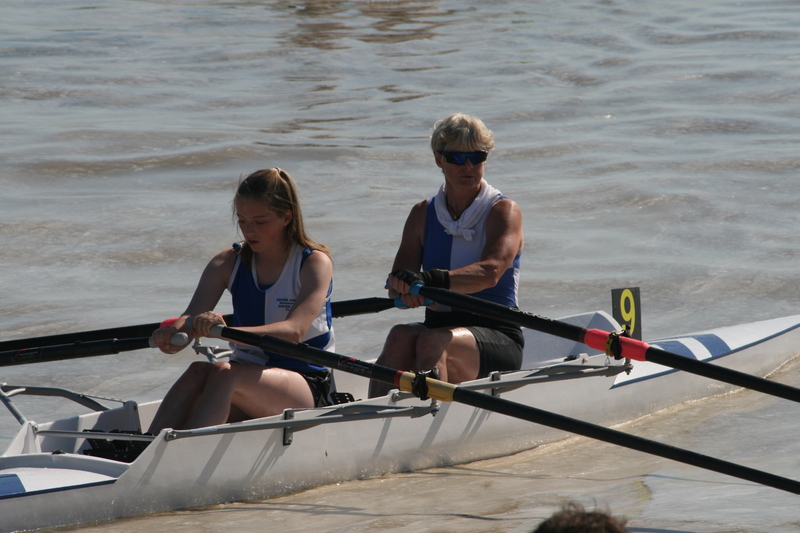 The Ladies Junior 4’s saw Jen Jordan, Purvis, Maria West-Burrows, Smith coxed by Jo Johnston in a very competitive class. 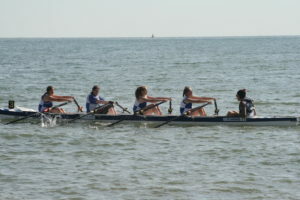 With crews running in shore the ladies crew did well to keep their turn before running home in 4th. 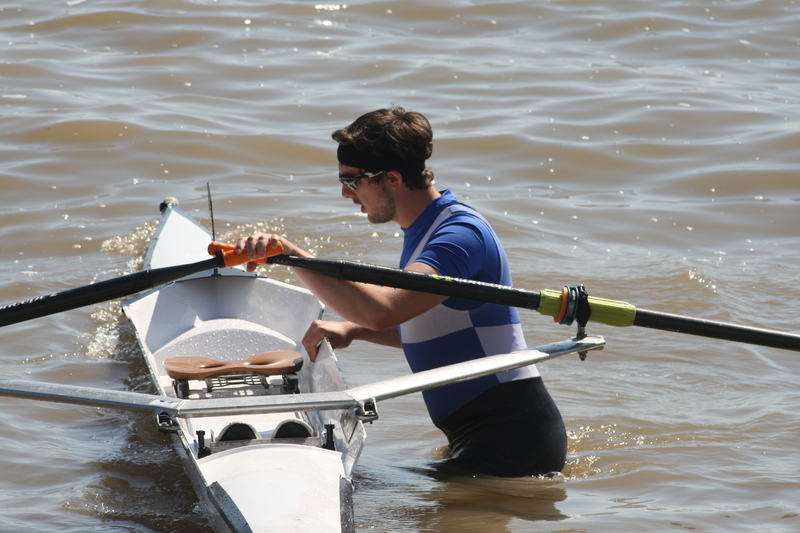 The Men’s Novice 4 of Ollie Scrivener, Michael Ripault, Peach, Jacob Scrivener coxed by Jordon battled hard through the turns but couldn’t run down the lead crews finishing in 5th. 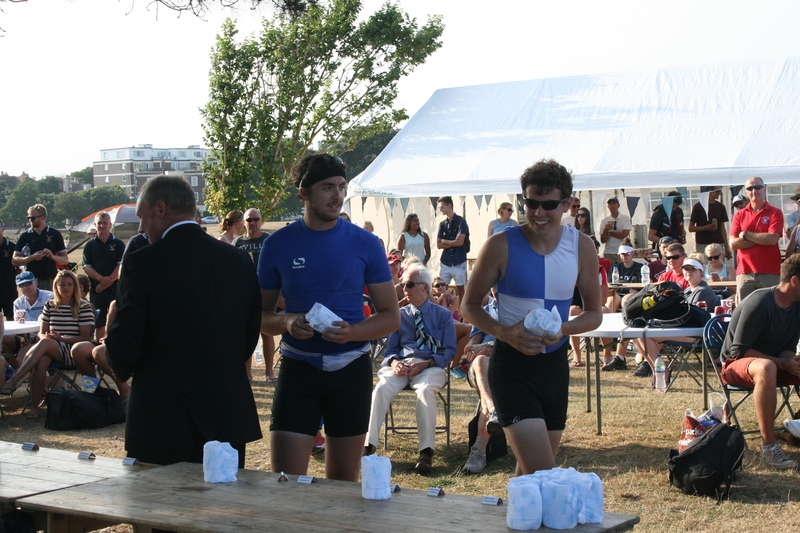 Their Junior counterparts Guy Hadfield, Jon Cook, Hall, T Stothart coxed by O Scrivener were unable to get into the mix finishing in the last points place in 6th. 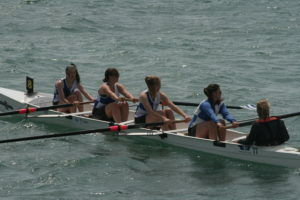 Dover had 3 crews in the Ladies Double Sculls Johnston / Jordon, West-Burrows / R Stothart and Smith / Day. An evenful start saw West-Burrows and R Stothart get tangled up with another crew leaving them trailing the field. Johnston / Jordon double competed well through the first turn and established themselves in third at the finish with Smith / Day in 9th and West-Burrows / R Stothart finishing 10th. 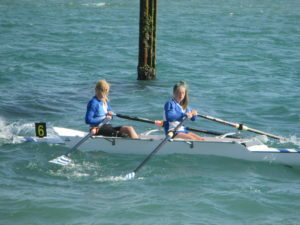 The Ladies single sculls had Johnston and Lizzie Foley competing. Foley had the better start but was soon overhauled by Johnston who would fight for second place before finishing 3rd, whilst Foley came home in 6th. The Ladies Pairs races saw Johnston and West-Burrows come home in 5th in the Senior event and Juniors Jordan and Purvis missing out on points in 7th. 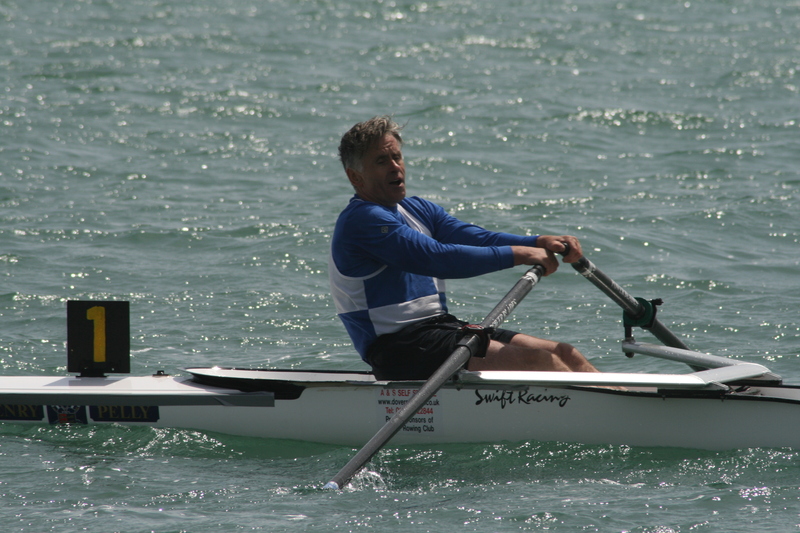 The Masters 40+ Fours of West-Burrows, Ripault, Nick Bailey, Burrows coxed by O Scrivener came home in 5th. 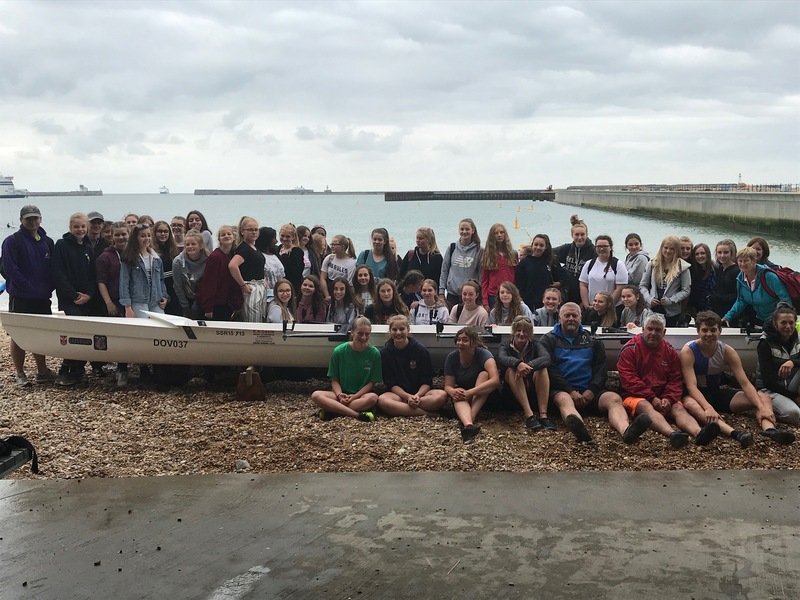 Dover Rowing Club opened their doors (shutters) to welcome Dover Grammar School for Girls for a two day introductory rowing camp this week. 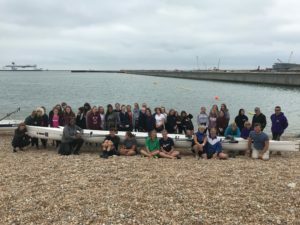 120 pupils experienced rowing for the first time by participating in a structured but fun program involving circuit training, ergo (rowing machine), team races and rowing in Dover Harbour in the club’s racing fours. 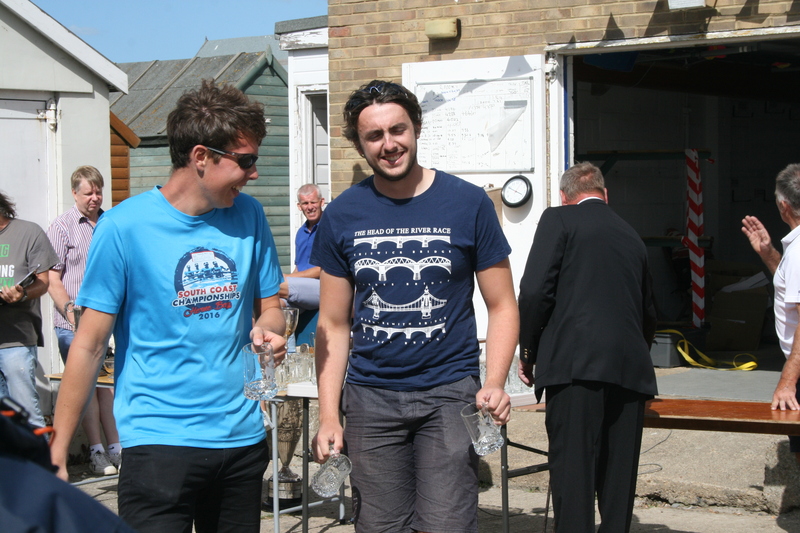 The camp was facilitated by volunteers from Dover RC and organised by the club’s committee and Safety Officer. The club would particularly like to thank the younger members involved, Ella Day, Jade Jordon, Rebecca and Tom Stothart, and hope to see many of the DGSG students again in the future. 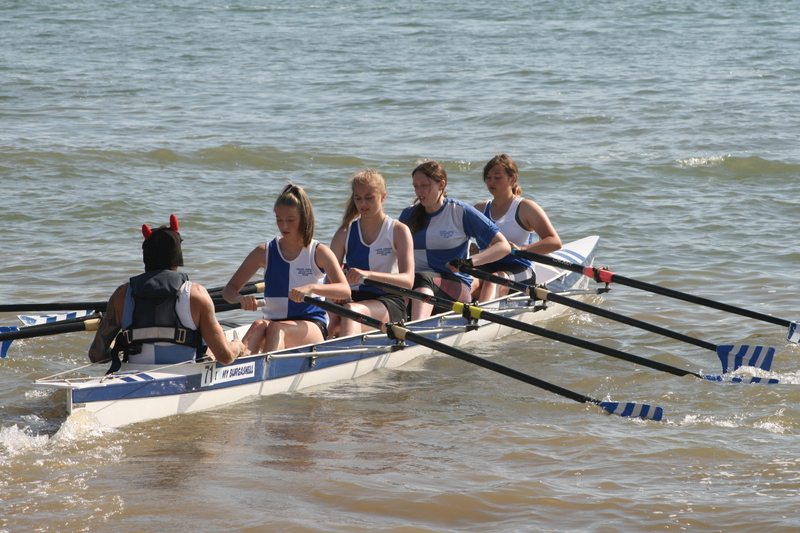 Anyone, young or older, interested in taking up rowing should contact the club via the website or Facebook page. 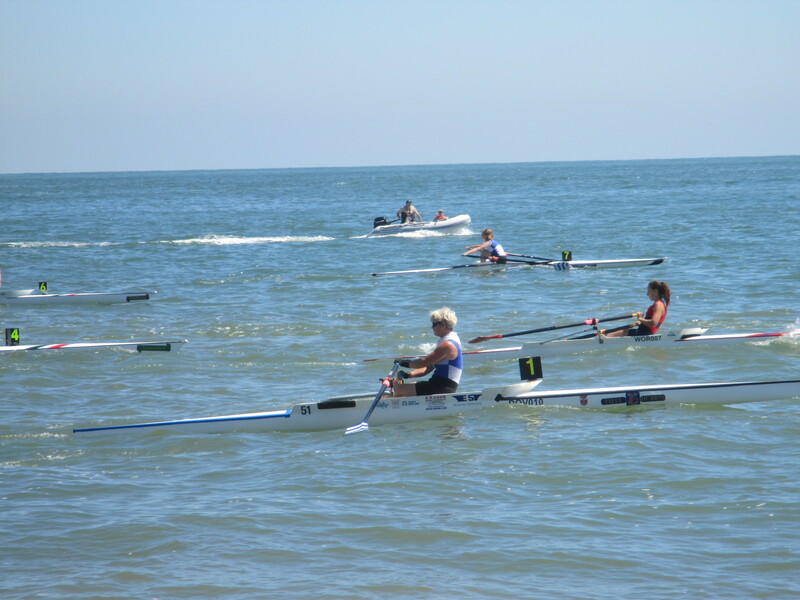 Dover Rowing Club’s Scullers led the way at Folkestone at the weekend with conditions more difficult than at earlier regattas this season. The Men’s Junior Sculls saw Chris Hall and Chris Price in action. 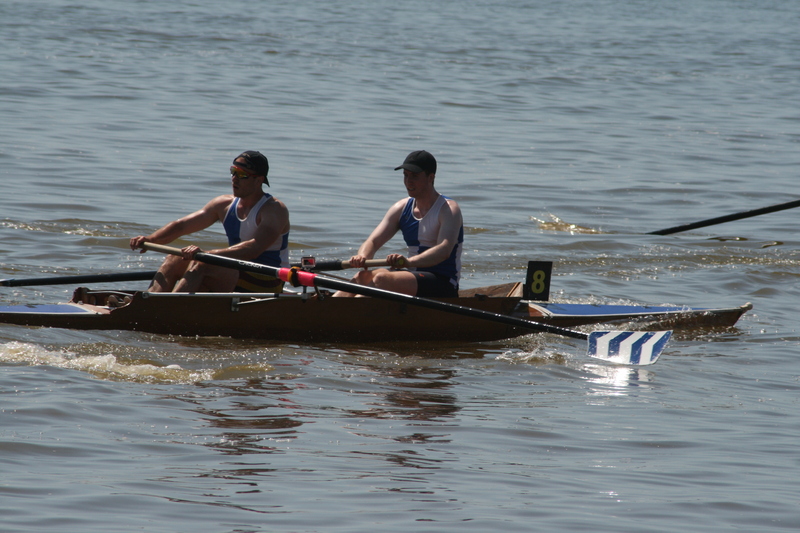 Hall got off to a good start and was up with the leading boats whilst Price was more cautious. 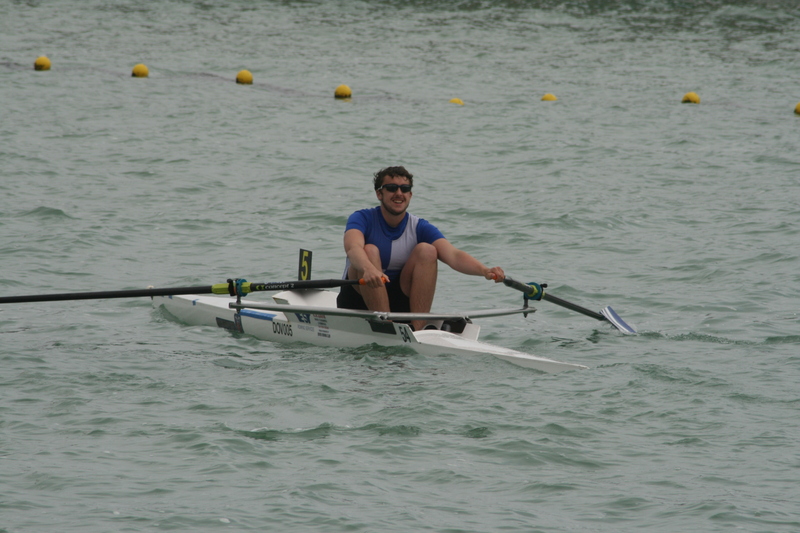 Hall reached the buoys in 3rd but with a good turn made up two lengths to move into 2nd. 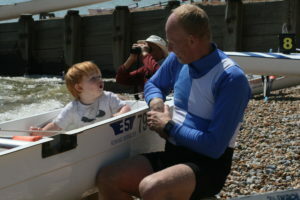 However the leading sculler capsized soon after the turn leaving Hall fighting Swarbrick from Shoreham for the victory. Price was steadily progressing through the field and was lying 4th with 500m to go. 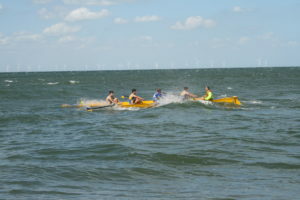 Swarbrick was leading in the later stages, with Hall pursuing hard, but also capsized, sportingly calling ‘well done Dover’ from the water as Hall passed him. 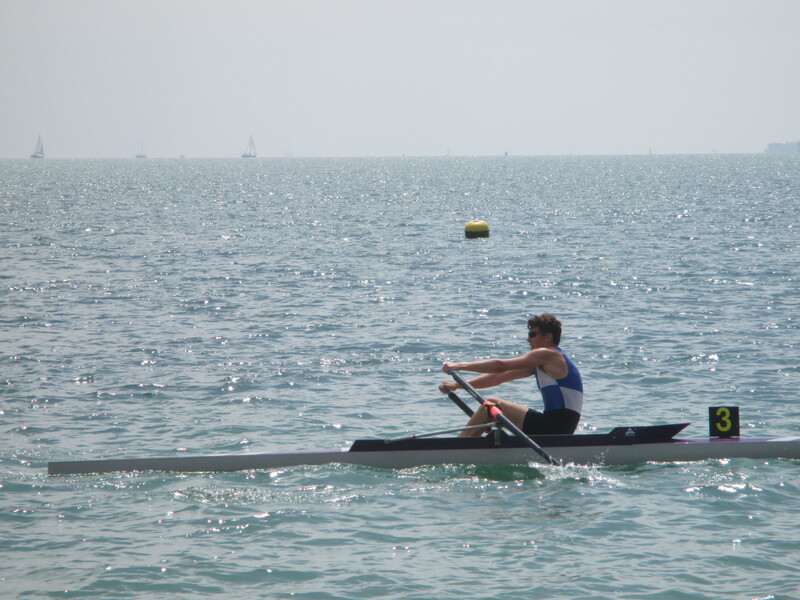 Hall held off a fast charging Bexhill Sculler to take the win with Price coming home in 3rd. 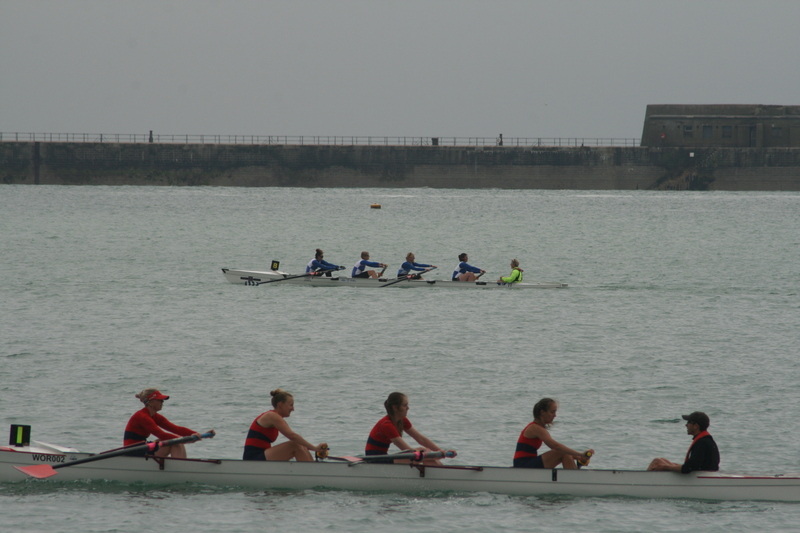 The Ladies Double Sculls saw Dover enter two crews, Jo Johnston / Rebecca Stothart and Maria West-Burrows / Jade Jordon. An early crab stopped West-Burrows / Jordon leaving them at the back of the field. Johnston / Stothart got off to a steadier start moving through the field to be 3rd at the turn. On the return leg Johnston / Stothart set sights on the 2nd place crew who they started to overlap with 300m to go. 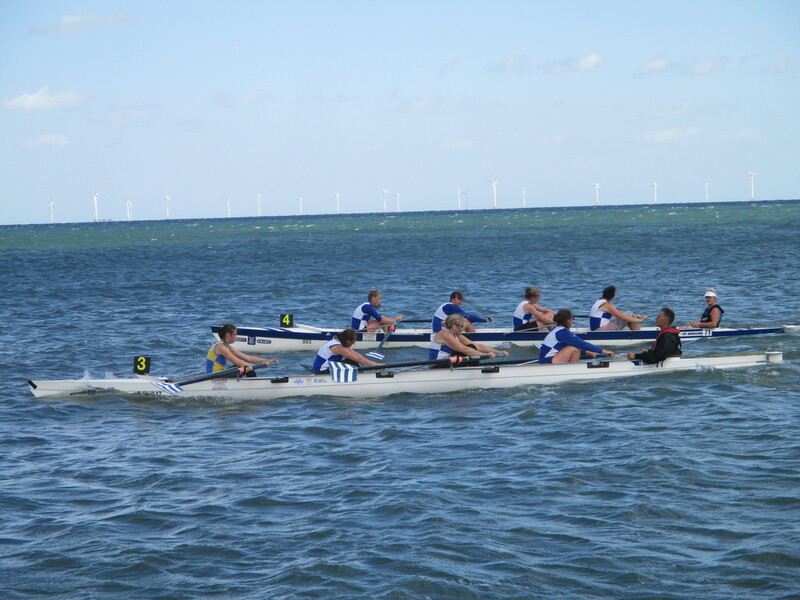 With heavier waves hitting both boats the pressure was applied by Dover who rowed through Herne Bay taking 2nd. West-Burrows / Jordon crossed the line in 8th. 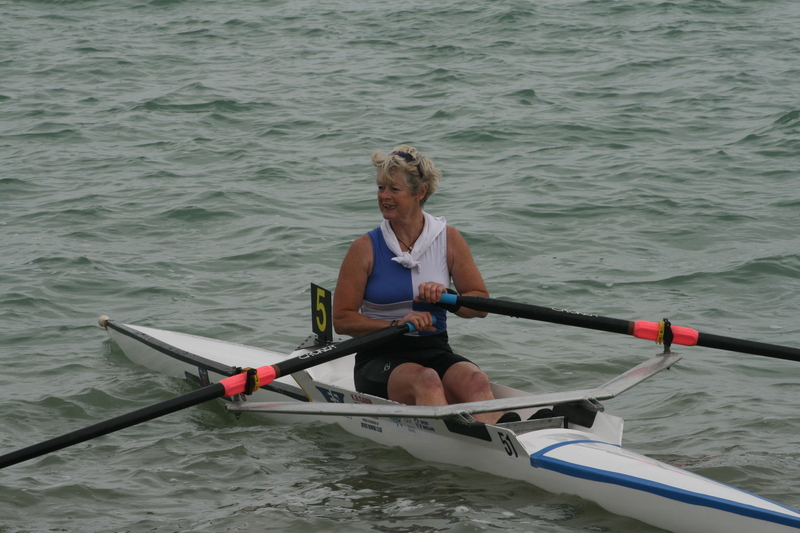 Johnston had earlier taken 3rd in the Ladies Sculls event which had seen her manage the conditions and survive a scare after the turn. 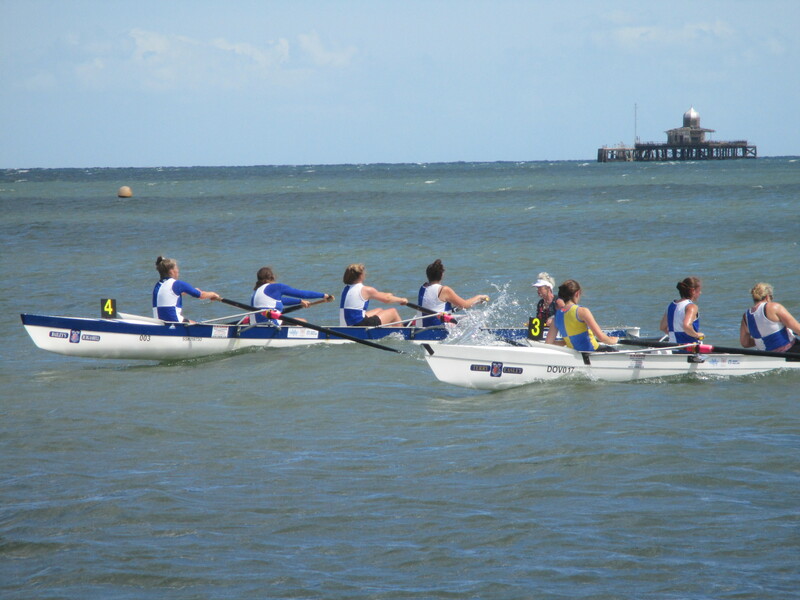 The J16 Ladies Quad saw Stothart, Chloe Bicker, Ella Day, Jordon coxed by Johnston enter a tight battle with Herne Bay for 2nd. 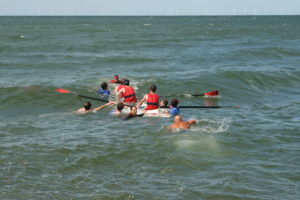 Dover’s youngsters pushed hard and started to overlap the inside crew before they ran out of water coming in 3rd. 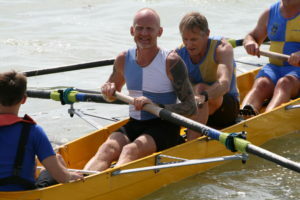 The Men’s Novice Sculls saw three boats in the two qualifying heats, Nathan Peach, Tony Burrows and Paul Scrivener. Peach and Burrows found the going tough in the opening heat finishing outside the qualifying positions. 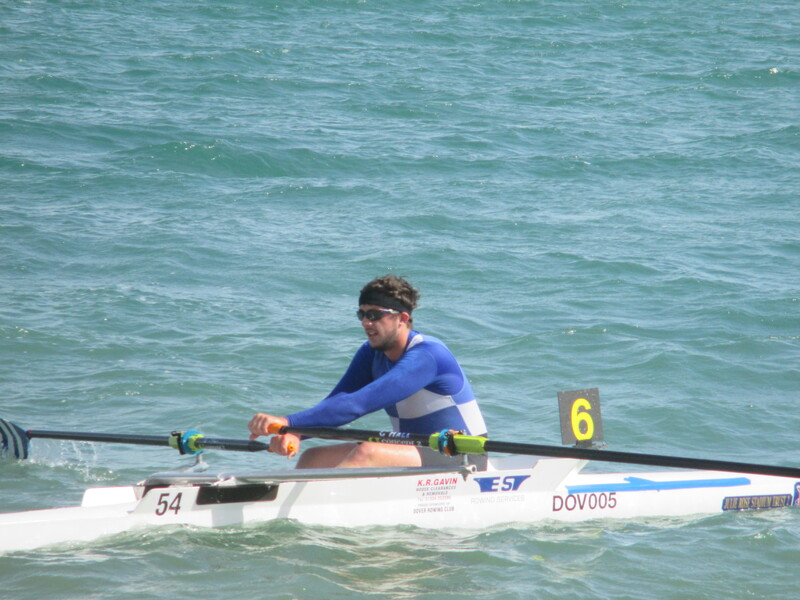 P Scrivener’s start looked disastrous as he was impeded by a Shoreham Sculler leaving both boats locked together. Once P Scrivener restarted he tore off in pursuit of the field passing several opponents to qualify comfortably. With an unfavoured outside lane in the final P Scrivener found conditions challenging as he headed to the turns. Moving inside on the return leg he gradually moved up the points positions finishing 4th. In the sweep rowing events the Ladies Novice 4 crew of Jordon, Stothart, Day, Kate Smith coxed by Chrissy Purvis got a good start from the outside lane turning 3rd. 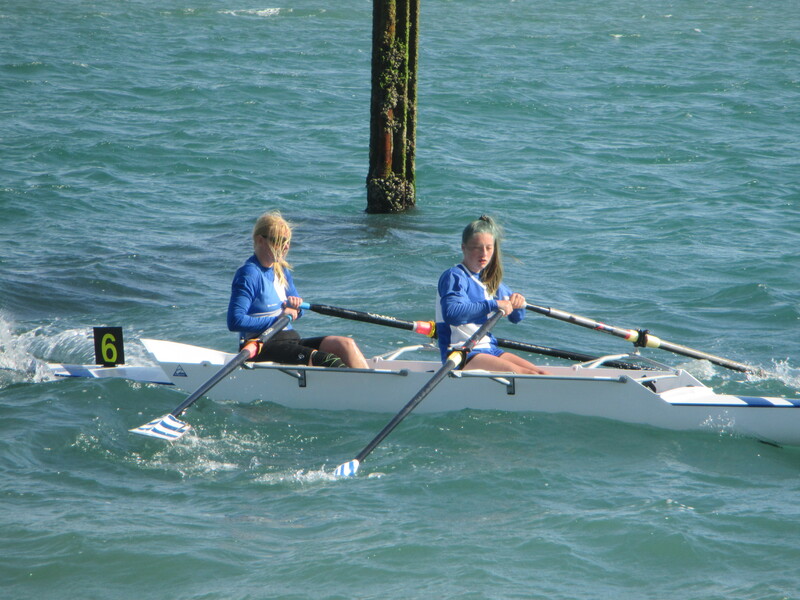 Slowly but steadily they closed the gap on the 2nd placed Folkestone crew and in the last 300m were neck and neck before pulling clear after surviving a heavy bow slap from a large wave. 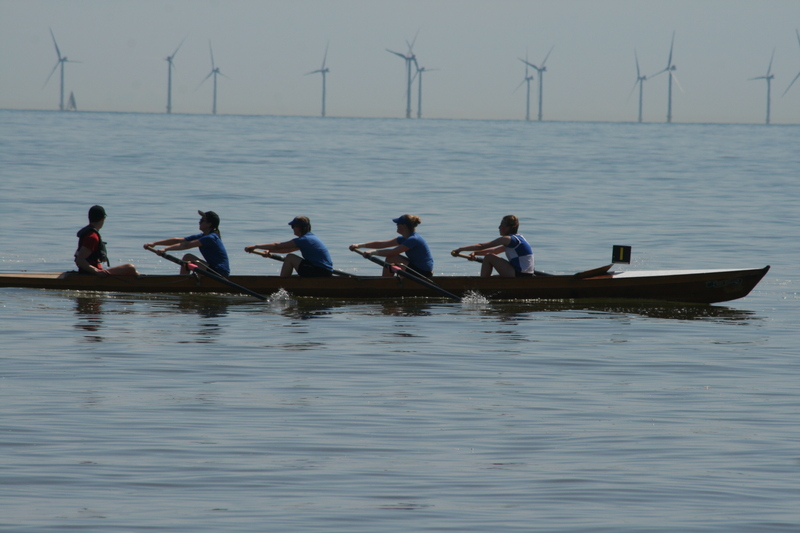 The Men’s Novice 4 of Taylor (Herne Bay), Jon Cook, Peach, Jacob Scrivener coxed by Purvis got a solid start. 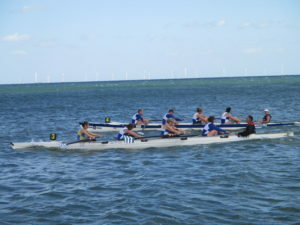 Their boat was just out of the points at the turn before moving up on return leg and just missed out on 5th after battling Herne Bay in the last quarter. 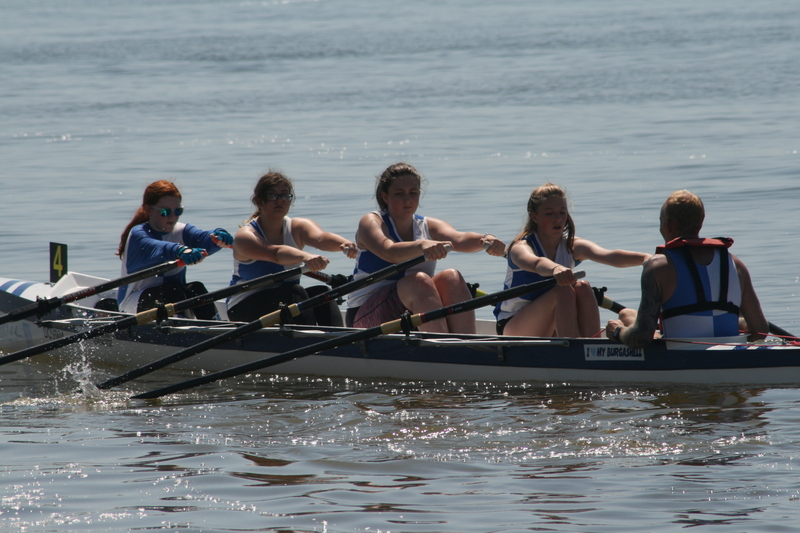 The Ladies Junior 4 of Jen Jordan, Purvis, West-Burrows, Smith coxed by Burrows worked hard on the outside to stay in contact with the inside crews. Turning in the middle of the field they fought to maintain a points finish in 6th. 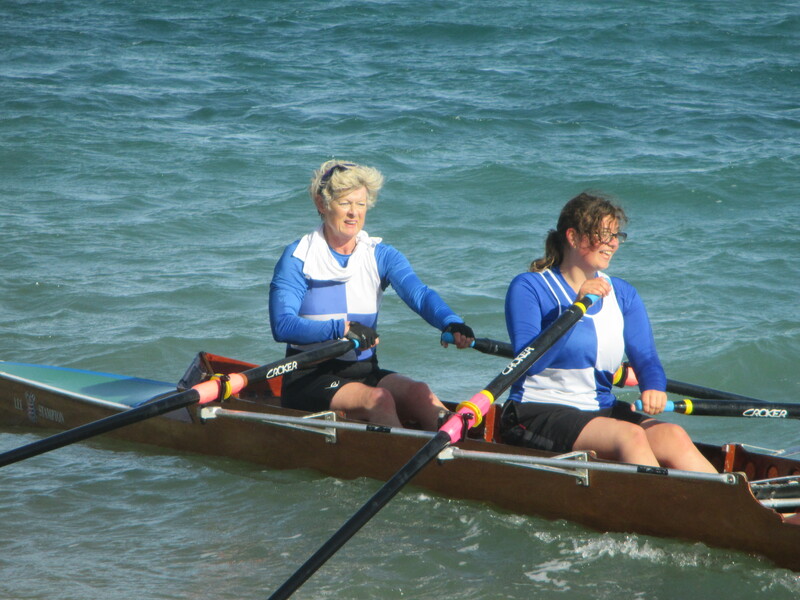 The Ladies Senior Pair of Johnston and West Burrows chased down Worthing at the turn and were pushing for 3rd to the line. 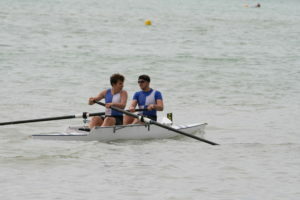 The Men’s Senior Pair of Hall and Burrows came home in 9th. 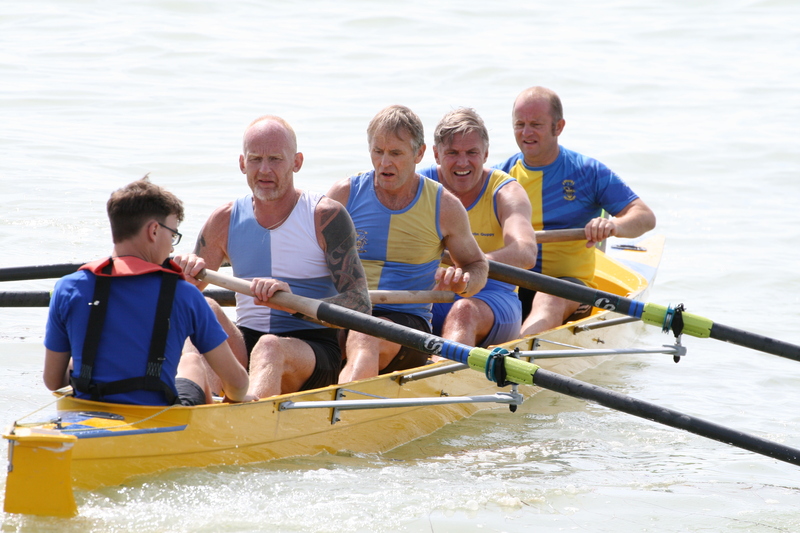 In other races the Masters 50+ crew of P Scrivener, Dixon (Shoreham), Nick Bailey, Burrows coxed by Purvis came home in 6th, Men’s Junior 4 saw Toby Scrivener, Cook, Peach, Neil Scrivener coxed by P Scrivener come home in 7th. The Junior Senior 4, featuring P Scrivener, Cook, Hall, Burrows coxed by Jordon, finished 7th after initially leading at the 500m mark. 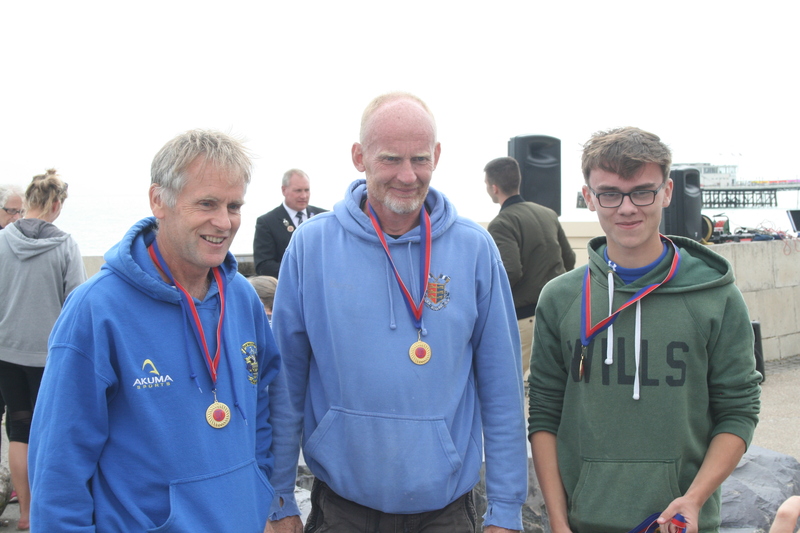 Dover Rowing Club had an excellent home Regatta seeing wins for the Men’s Fours crews and a high overall points performance. 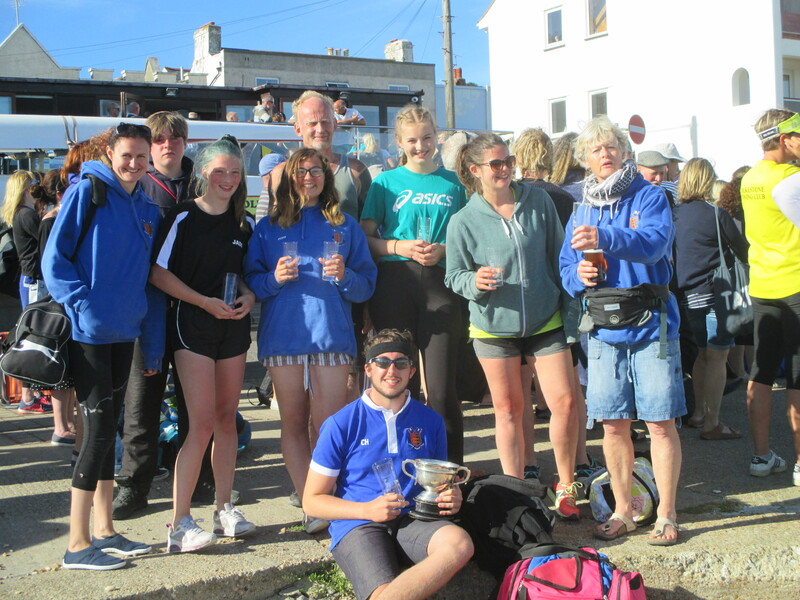 Dover Rowing Club had an excellent home regatta at the weekend which saw the club highly placed in the overall points competition following a strong turnout from the Dover Rowing community. 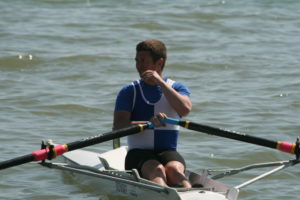 The Men’s Fours crews led the results, taking two wins, whilst several second and third place finishes came in other events. The Men’s Junior Fours crew of Angus Fraser, Ed Thomas, Chris Hall, Tom Stothart coxed by Cameron Mackintosh, featuring two Novices got a great start and were amongst the leading crews at the buoy turn with Bexhill leading. 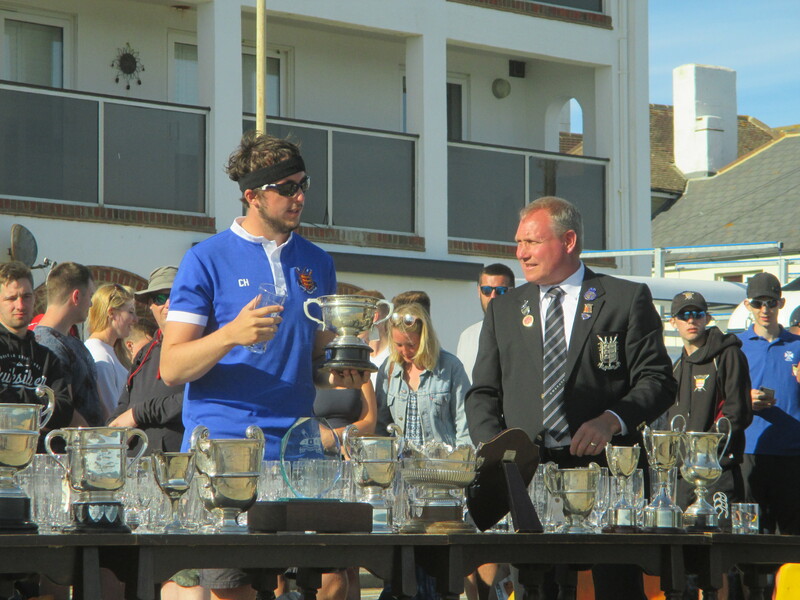 The return leg rapidly became a head to head battle as Dover ran down Bexhill with a tight finish seeing Dover triumph by under a boat length. 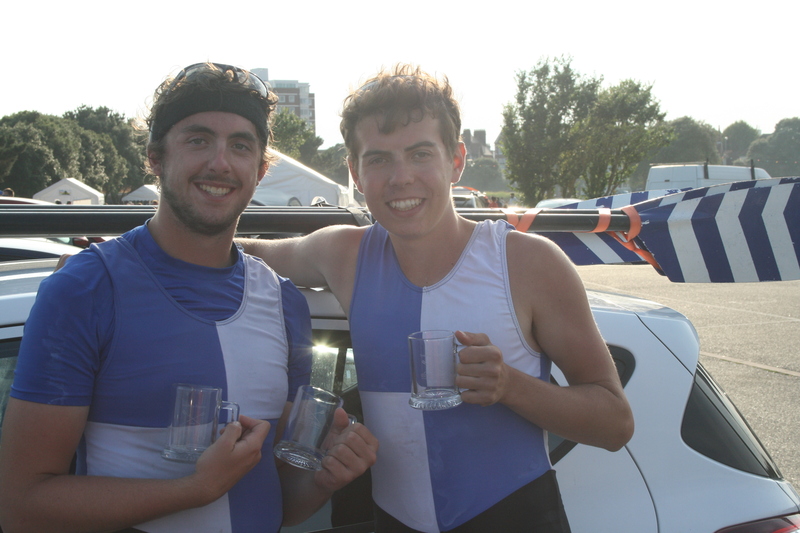 The Men’s Novice Fours featured brothers Toby and Jacob Scrivener who were joined by Fraser and Thomas, and coxed by Paul Scrivener. 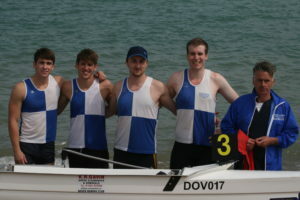 Dover’s B crew in this event contained Mackintosh, Nathan Peach, Ollie Scrivener, Michael Riplaut coxed by Jade Jordon. Dover B got the better start and were ahead of Dover A over the first part of the race. Dover A steadily applied their training and eased past their team mates and through the field to turn in the lead. Despite Shoreham’s best effort the Dover crew extended to a two length lead which they maintained to the finish line. Dover B acquitted themselves well given their level of experience coming home 7th. 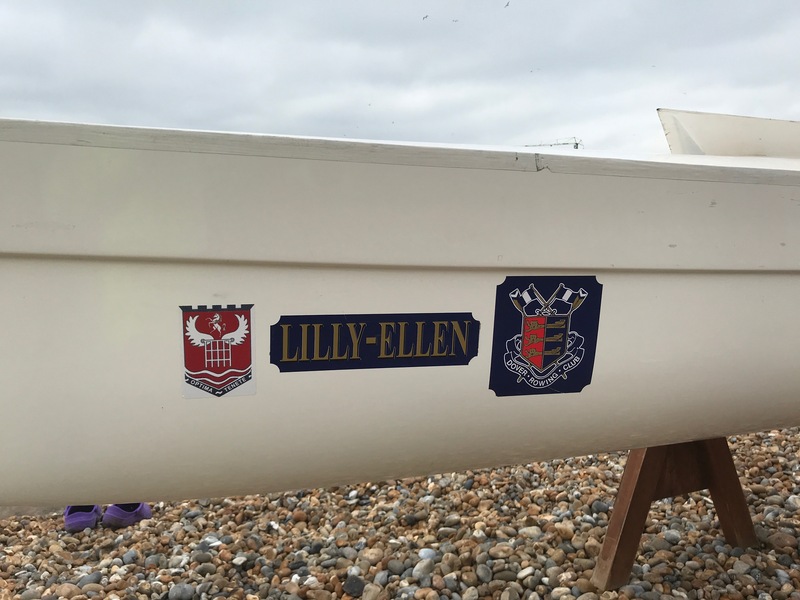 The Stothart family’s success continued in the Ladies events as Rebecca Stothart joined Chloe Bicker, Morgan Evans, Jordon coxed by Jo Johnston to compete in the Ladies J16 Quad Sculls. In the straight sprint event the Dover crew got off to a good start running neck and neck with Herne Bay until their opponents showed their power and pulled away. 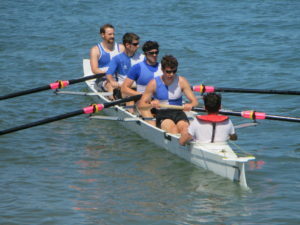 Dover’s crew comfortably led the 3rd place crew to the line to secure 2nd. Young Lucy Horton raced with Herne Bay in the J14 Quad Sculls race coming home in 3rd place. The Novice Ladies Fours had R Stothart, Ella Day, Evans, Jordon cox by Johnston with Dover B comprising of Catrina Moore, Hilary Horton, Antonia Reed, Amy Lewington coxed by P Scrivener and Dover C with Sue Faraone, Sophie Wolfenden Kate Day, Kate Smith, coxed by Tony Burrows. Dover A got the better of the starts and moved into competition for the lead whilst the largely inexperienced crews struggled to make headway. Dover A turned third but were moving well, overtaking Deal before closing on the leading Folkestone boat. 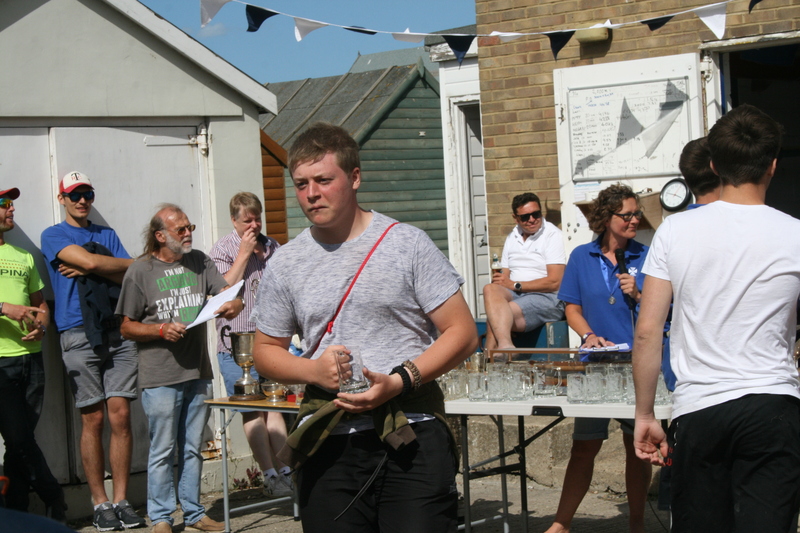 Disaster struck as Evans caught a crab stopping the boat, great composure was shown by the young crew as they recovered quickly to finish 2nd. 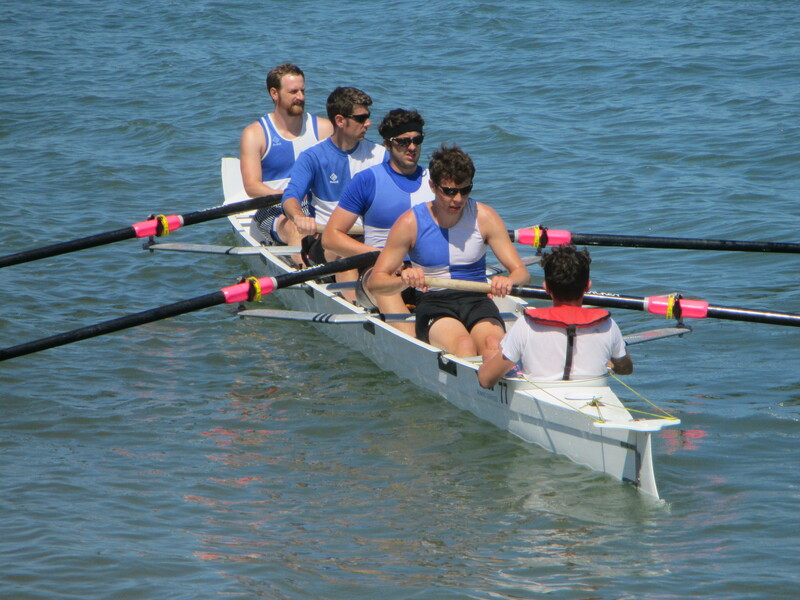 Dover C and B crews pushed on in the latter part of the race to finish in the points in 5th and 6th respectively. The Men’s Junior Pairs saw the fours crew compete against each other with Hall and Stothart as Dover A and Fraser and Thomas as the B crew. Dover A got off to the cleaner start as the B crew had an early clash of blades with Folkestone. 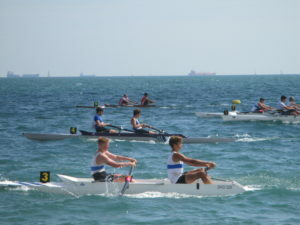 By the turn the B crew had moved into second behind Herne Bay who they chased to the three quarter point where an adjustment in their line saw the chance of victory expire, leaving them to secure 2nd place. 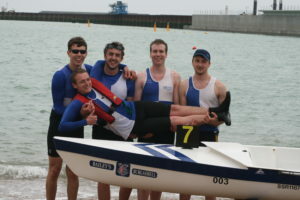 The A crew were caught in a battle with Bexhill that saw them fall to 4th. 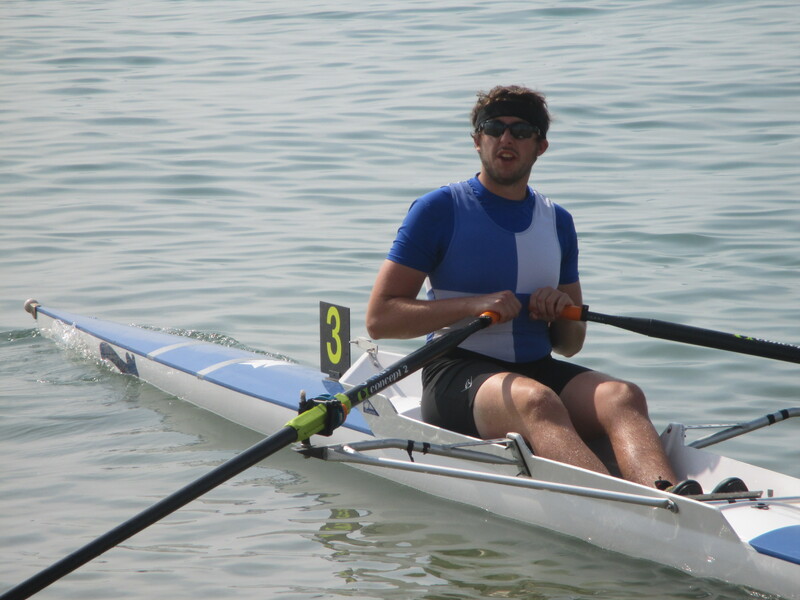 The individual sculling events saw heats for the Men’s Novice sculls that saw Stothart and Burrows qualify for the final with Thomas just missing out. 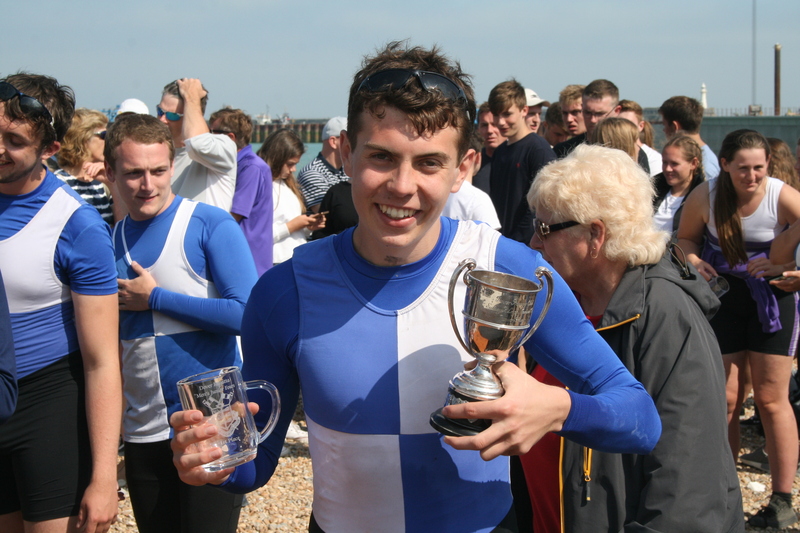 Young Peach had a creditable first sculls race remaining in contention up to the buoys giving him a good platform to build on for the future. Both Peach and P Scrivener missed out on the final. A tired Stothart lined up with Burrows in the final hoping to repeat his win from last week. 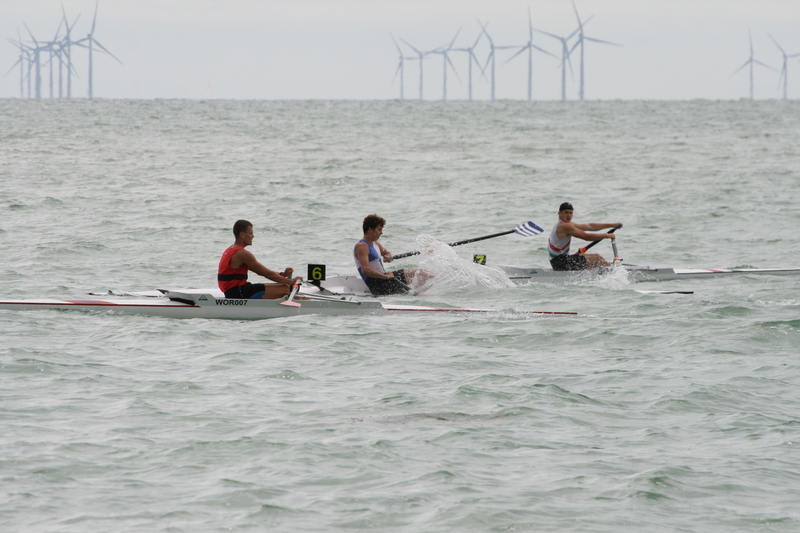 On the less favoured inside lanes Stothart set off in a tight race with his neighbouring Herne Bay sculler whilst Burrows was pushing hard from the outside lane. Stothart turned second but was unable to catch the lead boat seeing him finish second with Burrows just missing out on points in 7th. 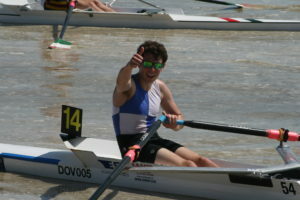 The Men’s Junior Sculls featured Hall and Chris Price in a straight final. 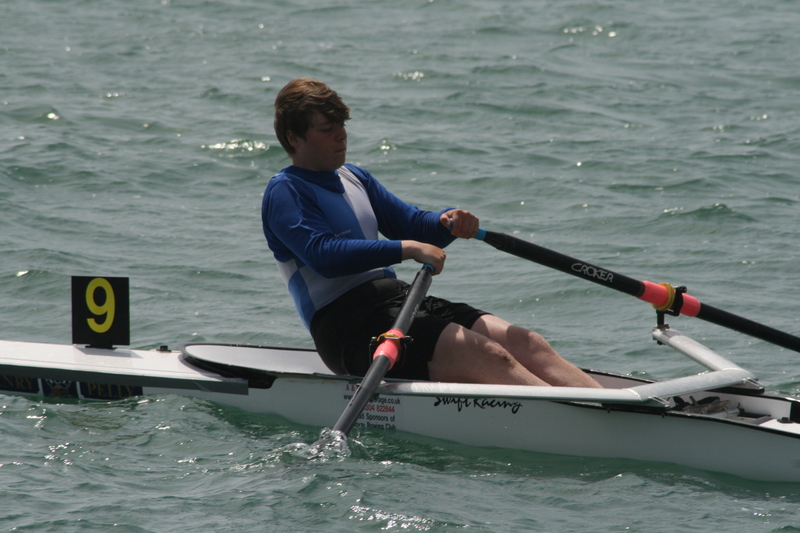 Hall got off the start in first and entered a duel with his University Rowing Captain who competes for Bexhill. Price found himself in the mix for the points finishes. 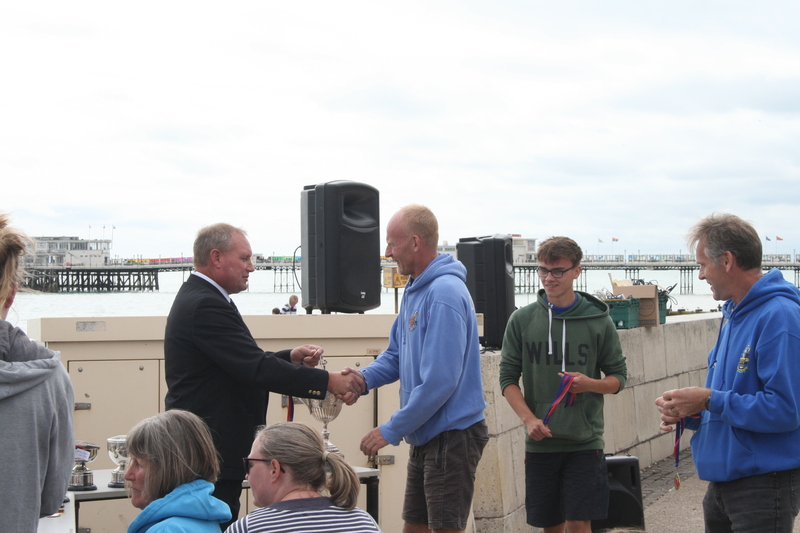 At the turn the Bexhill sculler led Hall who chased hard on the return leg but found himself fending off a fast closing Deal Sculler as Hall came home 2nd whilst Price narrowly missed out on points coming home 7th. 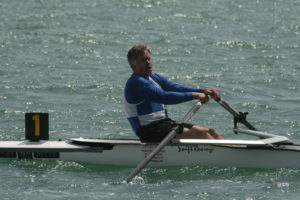 The Ladies open sculls saw Johnston in a small field. 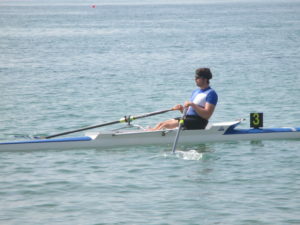 By the buoys Johnston turned third, still hoping to compete for the top spot, before the lead sculler extended her lead. Johnston eventually came home in third. 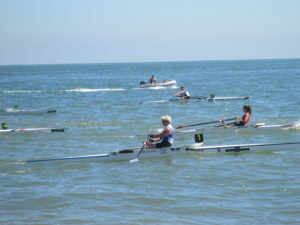 There were three crews in the Ladies Double Sculls Dover A – Johnston and Jordon, Dover B – Maria West-Burrows and Day, Dover C – Smith and Stothart. 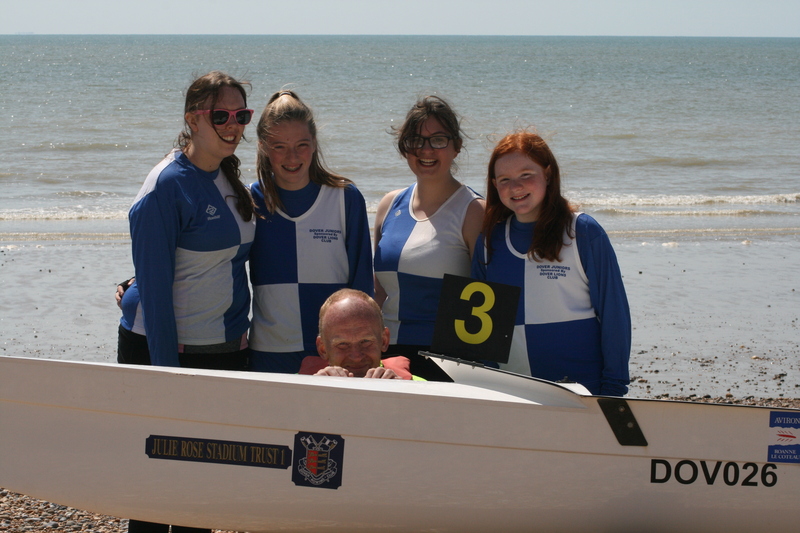 Dover’s A crew had a strong start and were initially running with Shoreham whilst the other crews were fighting for points finishes. As Shoreham made a decisive break for what would be an easy win the Dover crews fell into a fight with each other with the A crew finishing 4th, B in 5th and C taking the last point in 6th. In the Ladies Junior Fours race the Dover crew of Jen Jordan, Chrissy Purvis, West-Burrows, Smith coxed by Johnston got a great start which saw them in the top 4 boats in a large field. With two crews pulling away Dover battled the Worthing inside crew. Turning together Dover gradually pulled away to narrowly take 3rd place. 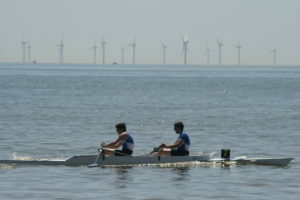 The Ladies Junior Pairs saw Jordan and Purvis compete in their first race pairs race. 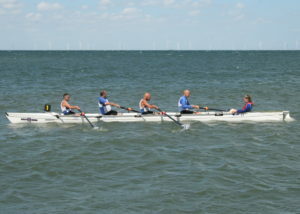 They had a good start and maintained a good line on the outward leg turning with a group of other crews. Maintaining form they approached the finishing line and were surprised to find they had 3rd place. 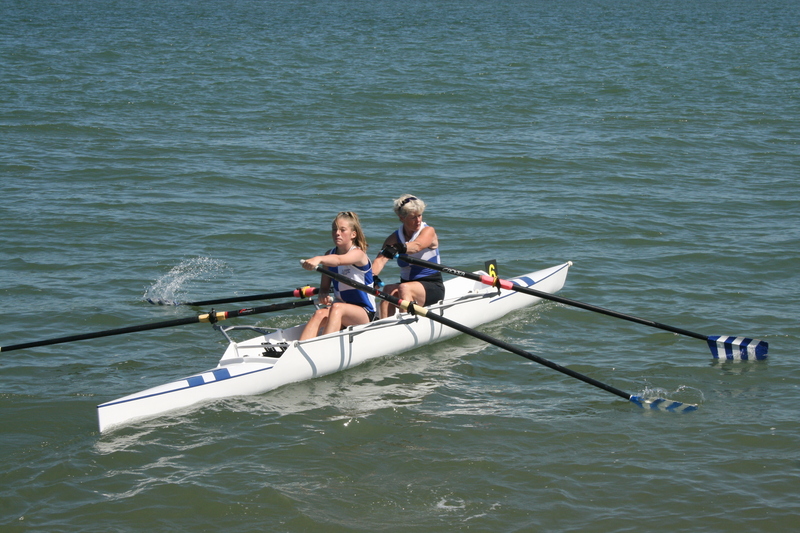 The Ladies Senior Pair of Johnston and West-Burrows found themselves pursuing two strong Shoreham crews. By the turns it was clear that Dover’s crew could not catch the leaders coming home in 3rd. Masters 50+ fours saw P Scrivener, Shoreham’s Jim Dixon, Nick Bailey, Burrows coxed by Purvis put in a good performance taking 3rd. 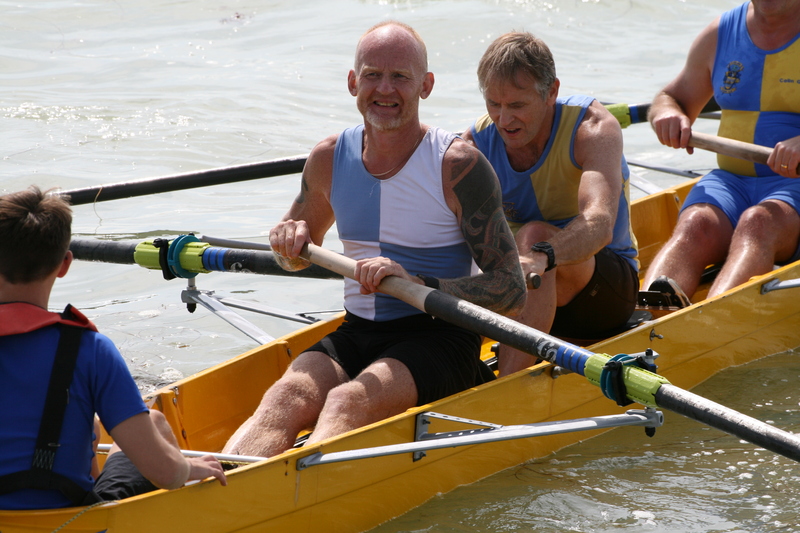 Masters 40+ fours had Riplaut, P Scrivener, Bailey, Burrows coxed by Jordon acquitting themselves well coming home in 4th. 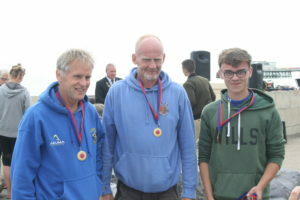 Men’s Junior – Senior Fours crew of P Scrivener, Riplaut, Neil Scrivener, Burrows coxed by Jordon secured an opportunistic 2 points. 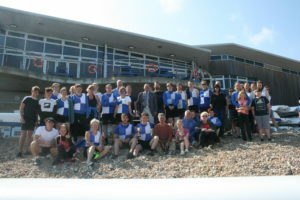 A&S Self Storage Ltd, A.T. Garage Services, Mr N J Bailey, Mr M Barnett, Burgashall, Mr K Bowman, Carl’s Recovery, Cherished Gowns, Mr N J Cooke, Mr P Darlington, Designed Interiors, Dover Express, Dover Harbour Board, Dover Lifeguards Club, Dover Water Sports Centre, East Kent Mercury, Jane Forryan, Mr P Gladwin, Health and Safety South East Ltd, K R Gavin Removals, Kevin Ulyatt Property Maintenance and Handyman, Mr K C Goodwin, Mrs J Hall, Ju’De Martial Arts, Kenley Driving School, Kent Recycle, Kent Stonemason, Lisa Burnett Therapist Reflexologist, Mariner III – Malcolm, MaSt Recruitment, Mr D Newman, Parkers Design & Print Canterbury, Ratzkins, Riverside Catering Services, Sharp and Enright Ships Chandlers, Smye Rumsby, Mrs M Squibb, Western Heights Preservation Society, Mr A Whiting, Yoga with Hilary. 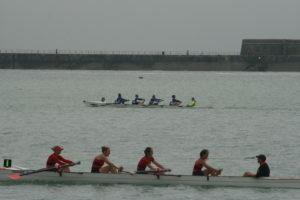 Dover regatta is on. See you all soon. 10.30am start. 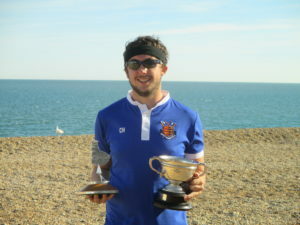 Dover Rowing Club’s secretary Jacky Silk had a busy time before Brighton and Hove Regatta requesting late entries due to Dover’s returning university contingent. Silk’s work paid dividends in the Men’s Novice Sculls as Tom Stothart was able to race alongside Club Captain Tony Burrows. 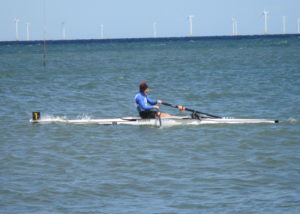 Whilst Burrows found the competition too hot to handle in the enlarged field Tom Stothart showed his improved technique as he powered off the line threading a route to avoid paddle boarders on the course. 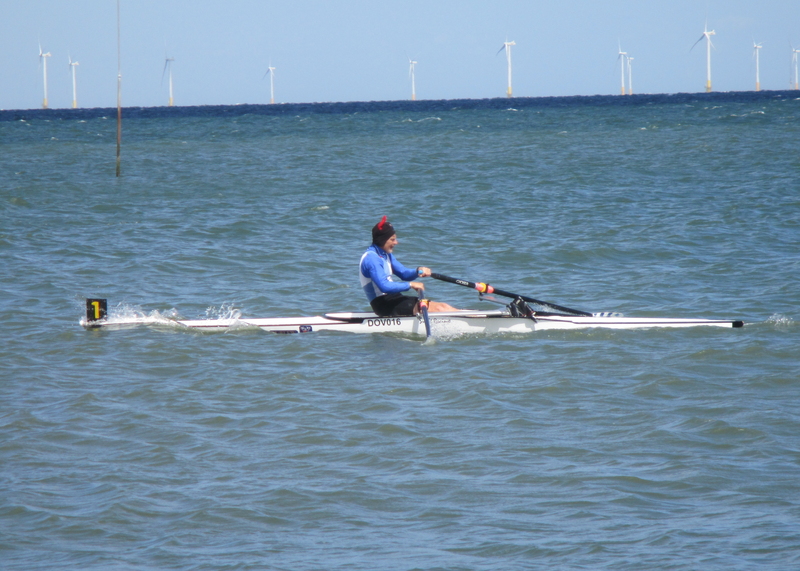 At the turn Tom Stothart was first but in the unfavoured outside lane, driving hard he moved more inshore increasing his lead on the return leg and winning by several lengths. Burrows came home in 10th. 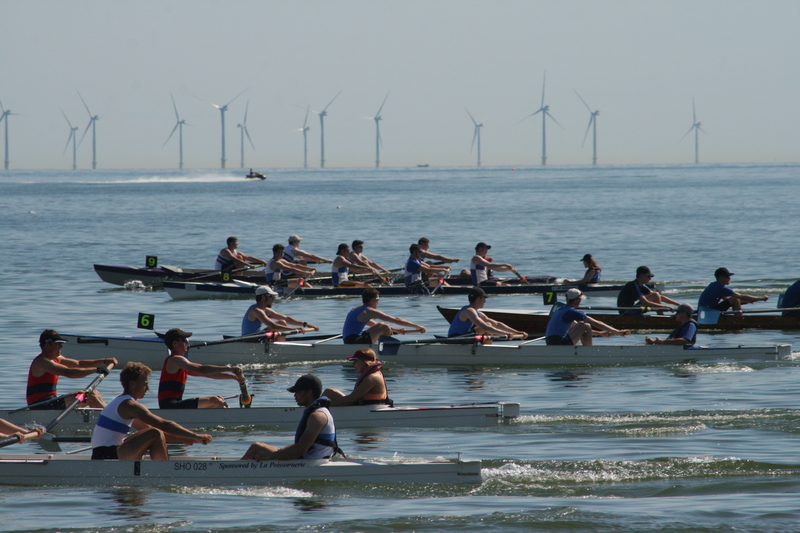 The first race of the day had seen Lucy Horton, Rebecca Stothart, Morgan Evans, Jade Jordan coxed by Burrows racing in the J16 Ladies Quad Sculls. 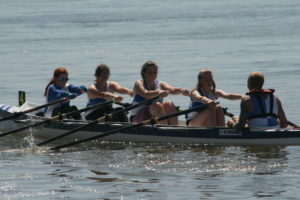 The young crew fought hard with two older crews jumping out into an early lead. 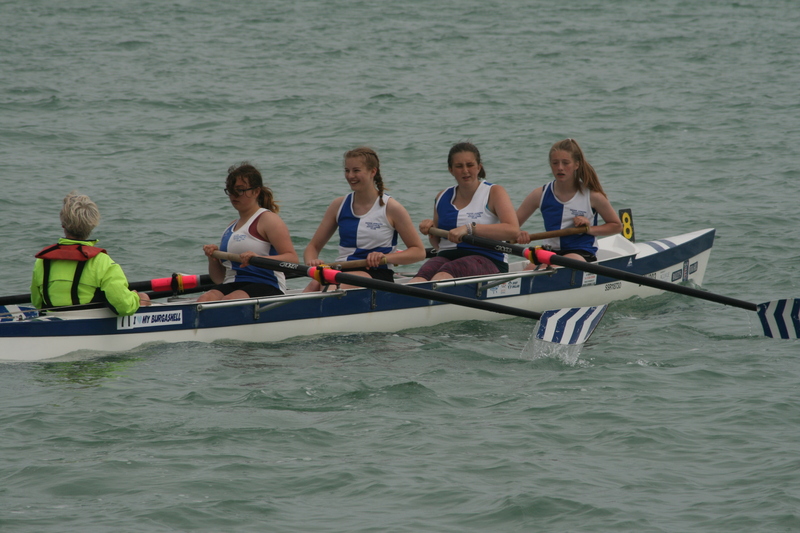 Dover’s ladies fought hard to remain in contention for 3rd place before dropping back to 5th at the finishing line. 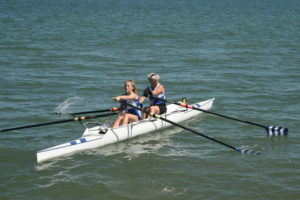 There was improved fortune for Jordon in her first sweep race where she joined a Herne Bay Novice Ladies 4. Jordon appeared to initially struggle with this unfamiliar crew before finding her rhythm. Turning first, they increased their lead scoring a comfortable win. Jo Johnston lined up next in the Ladies Sculls race an event she has championed to return to the CARA events calendar. Johnston had a good start in a large field and was fighting for third at the turn. 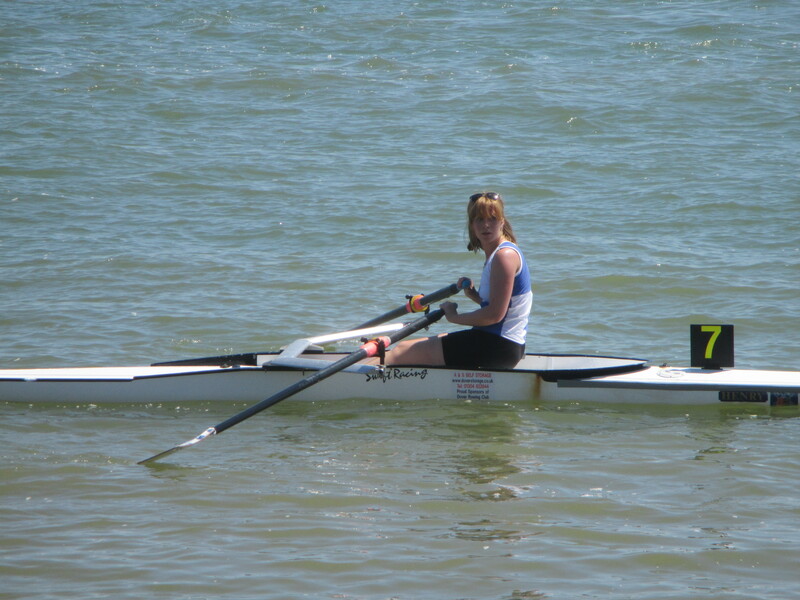 A problem slowed her in the last quarter before she kicked on to hold off an Eastbourne sculler taking 5th place. 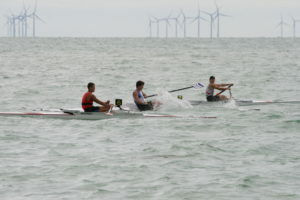 The Men’s Junior Pairs saw the Dover field two crews of Chris Hall / Tom Stothart and Josh Cullen / Ed Thomas. A good start saw both Dover crews up with the leaders at the 500m point with Hall / Stothart fighting the strong Herne Bay pair for first. Cullen / Thomas struggled a little with steering taking the widest line. 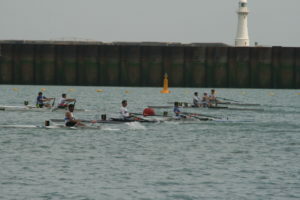 Hall / Stothart pursued the Herne Bay crew to the to the line taking second. 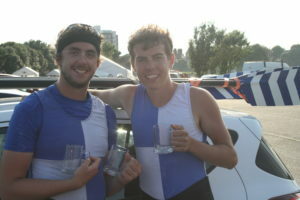 Cullen / Thomas worked hard on the return leg and finished in the points in 5th place. 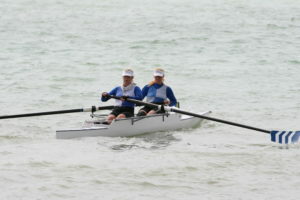 The Ladies Senior Pairs saw Johnston and Maria West-Burrows on the water. The pairing who prefer rougher conditions had a good start see them just behind the leading boats as they neared the turn. 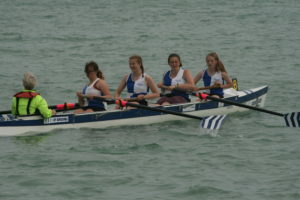 On the return they set their sights on the third placed Shoreham crew. Pushing hard the veteran rowers started to close as the line approached gaining an overlap before running out of water, leaving them in 4th. 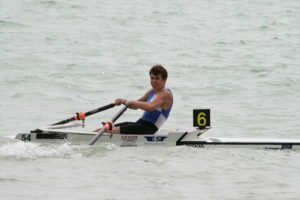 Hall, Dover’s sole entry in the Men’s Junior Sculls, was a little behind from the start as he pushed towards the outer buoys. 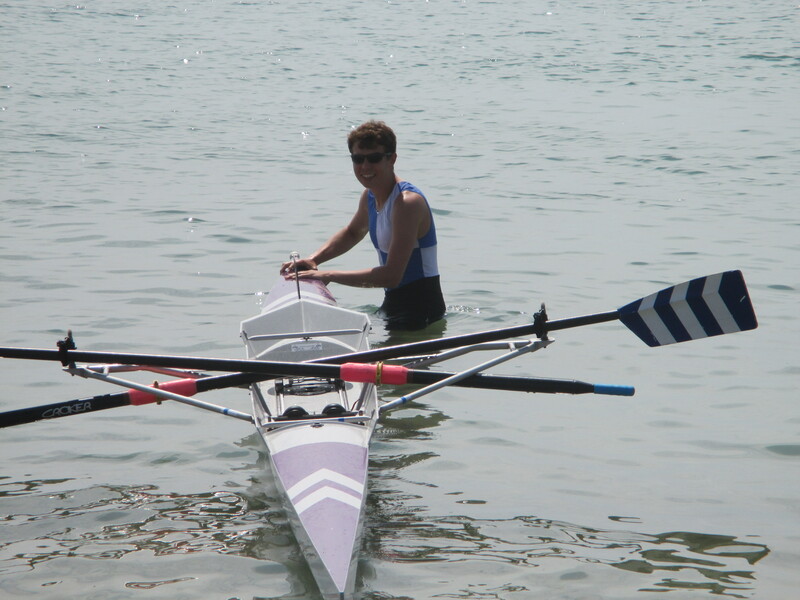 Turning second Hall was leading his Uni rowing captain at 1750m only to fade under pressure as the line approached leaving him in 3rd. Thomas, Hall, Cullen, Tom Stothart coxed by Jordon were out in the Men’s Junior Fours. A good start saw Dover’s crew in second in the first few hundred metres. A good coxing debut from Jordon helped the Uni boys push for third out of the turn and led to a head to head with the Shoreham crew on the return leg with Dover losing out by less than a canvas leaving them 4th. The last event saw West-Burrows / Rebecca Stothart and Johnston / Jordon competing in the Ladies Double Sculls. In another good field the Dover crews kept out of trouble in the outside lanes. 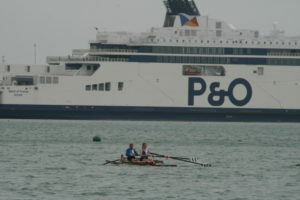 By the turns the middle lanes appeared to have the advantage with Dover’s crews struggling for the lower points places. 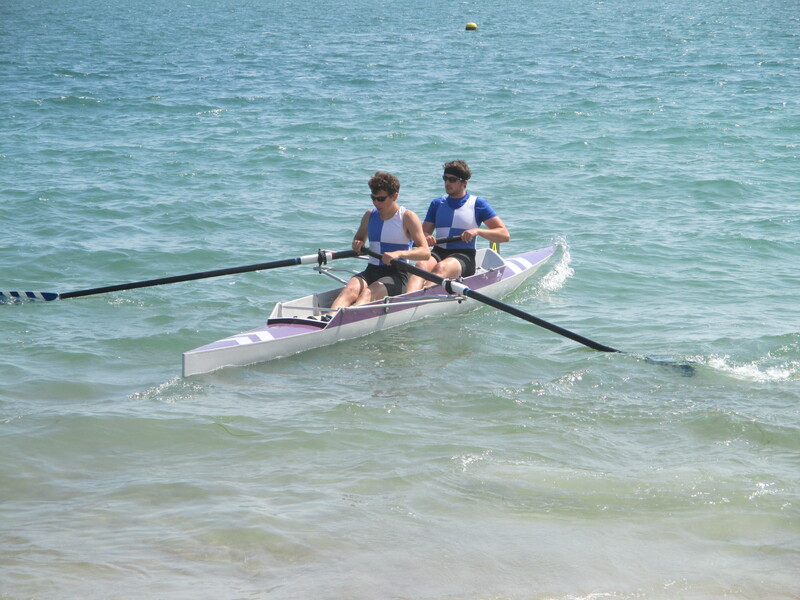 Johnston / Jordon narrowly missed out coming home in 7th whilst West-Burrows / R Stothart came home in 9th. 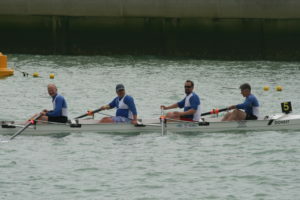 Dover RC eyes now turn to the weather as they are due to host their home regatta in Dover Harbour on Saturday 9th June. Racing starts at 10.30am. 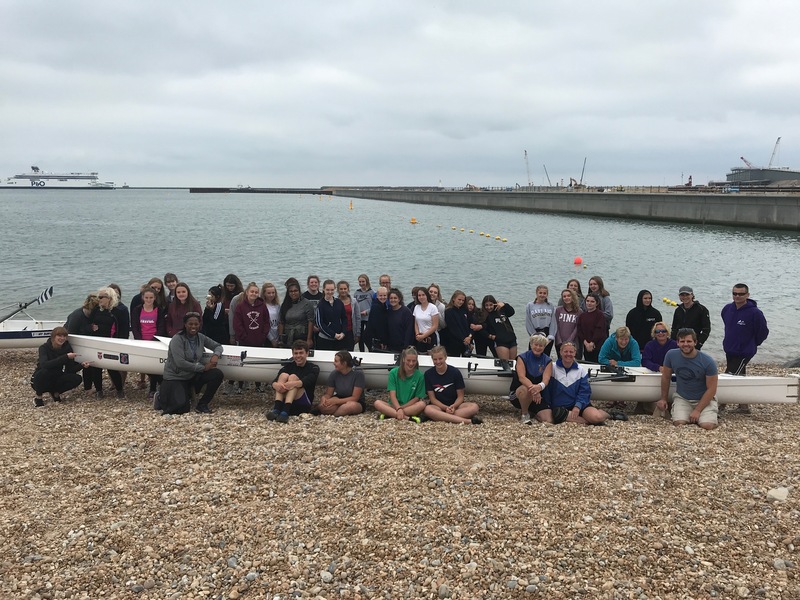 The weekend saw Dover Rowing Club in action in the opening regattas of the Coast Amateur Rowing Association season. 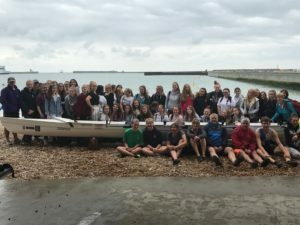 On Saturday Dover joined Hastings RC in celebrating their 150th anniversary with the regatta returning to their home waters for the first time in several years. 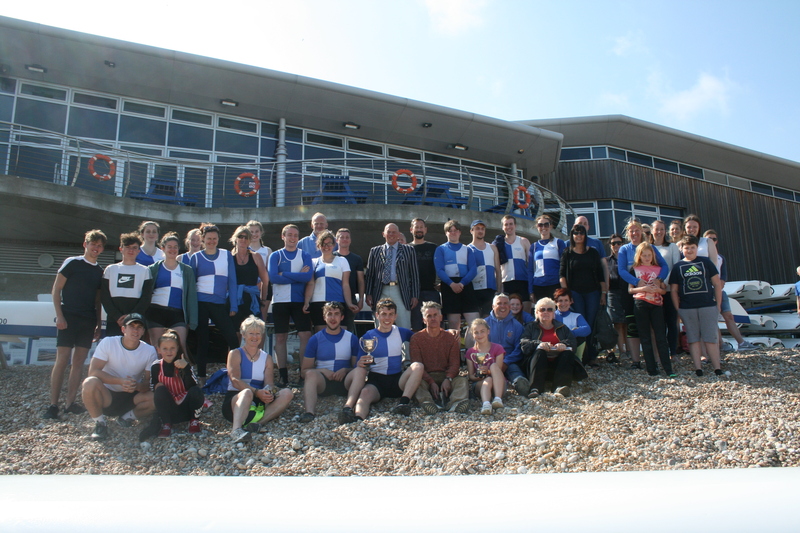 On Sunday the regatta moved to Bexhill. 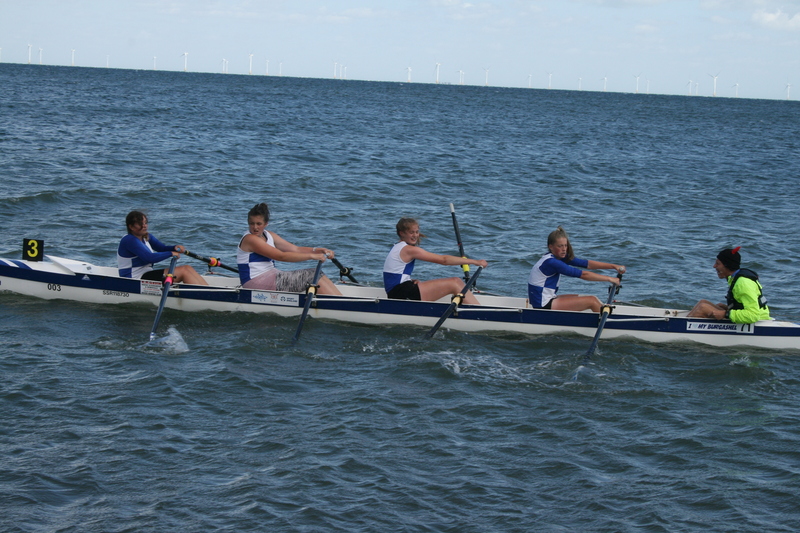 First on the water was the J16 Ladies Quad Sculls crew of Lucy Horton, Chloe Bicker, Rebecca Stothart, Jade Jordon coxed by Tony Burrows. 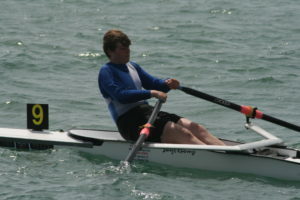 12 year old Horton was a late replacement having only recently started rowing. 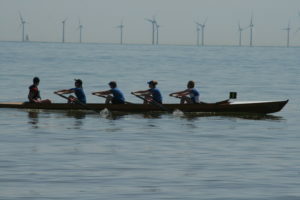 The young crew, featuring three first time racers, rapidly moved into second and at half way were a few lengths behind the lead boat. A strong last 500m saw them close down the Deal crew gaining an overlap before the finishing line and leaving them in a well deserved 2nd place. 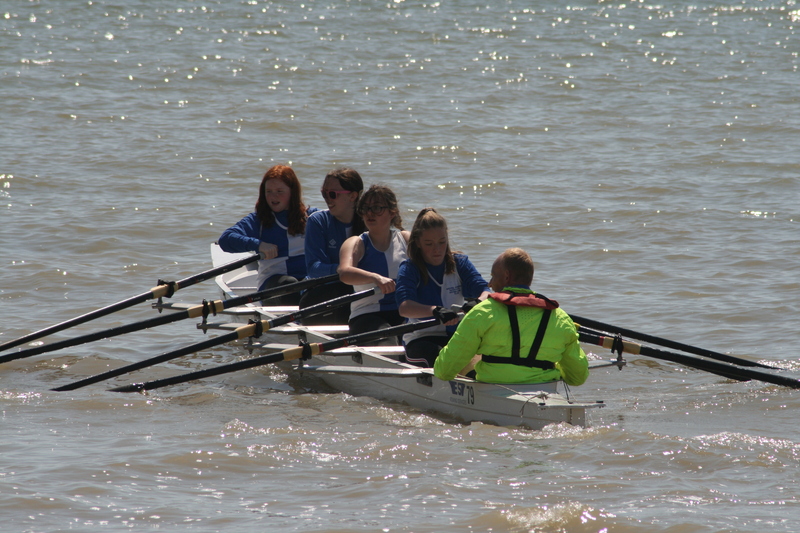 Bexhill regatta proved tougher for the young crew but they fought hard in a larger field to finish 5th. 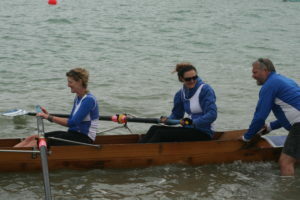 The Ladies Double Sculls saw Dover enter two crews: Maria West-Burrows / Stothart and Jo Johnston / Jordon. 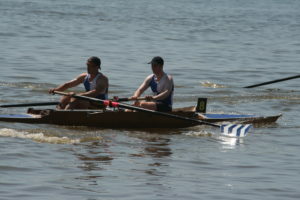 In a large field both crews struggled to compete with the leading boats. Fighting for points at the buoy turns, Johnston / Jordon came home in 6th place with West-Burrows / Stothart in 8th. 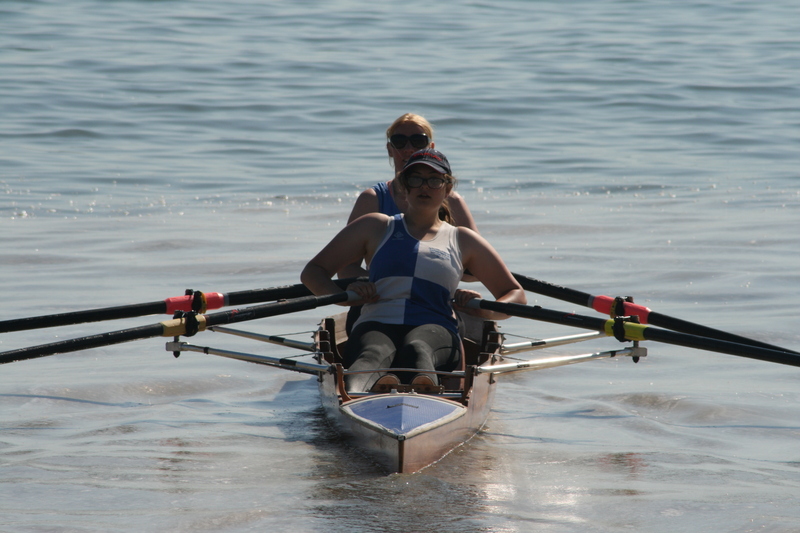 Stothart finished a busy session racing in a Deal novice ladies crew that came in 7th. 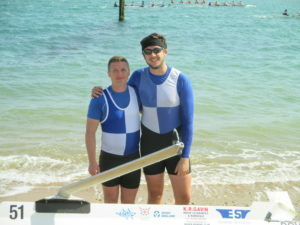 There was improvement for Johnston / Jordon at Bexhill where they finished 5th with West-Burrows / Stothart coming in 10th. 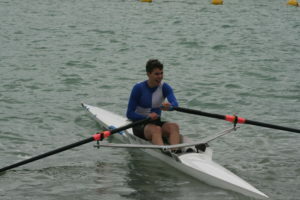 Club Captain Burrows found himself in the outside lane for the Novice Sculls and struggled on the outward leg. 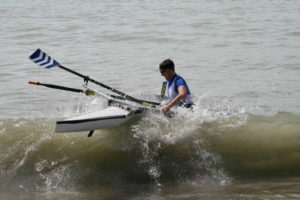 A great turn saw him jump three places and begin moving through the field only for his progress to be stopped by a capsize in front of him. This forced him to stop, manoeuvre and restart leaving him in 7th at the finish. Burrows had a similar outcome on day 2 steering round the rescue boat on his way to another 7th place. 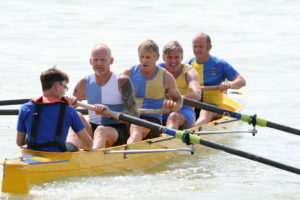 The Veteran 40 fours race saw Johnston, Nick Bailey, Burrows joined by Mark Jefferies from Herne Bay coxed by Chrissy Purvis. The crew got off to a great start and were towards the front of the field for the first 500m before dropping a little off the pace. 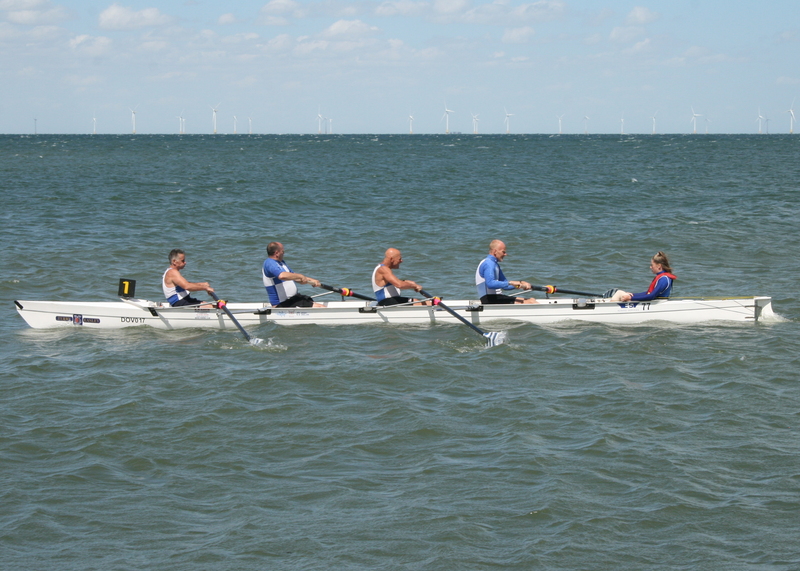 By the buoy turn the veterans were in 5th position which they held to the end of the race. 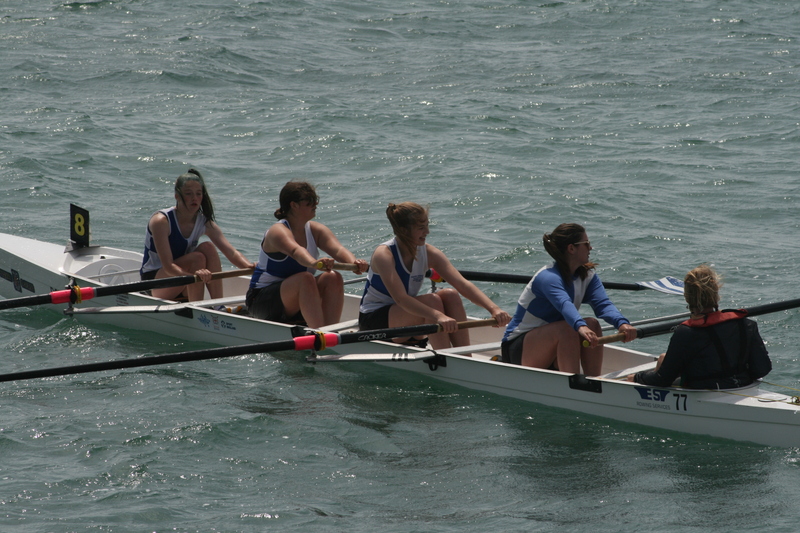 Ladies Junior Fours crew of Jen Jordan, Purvis, West-Burrows, Kate Smith with Johnston as cox were left slightly at the start before moving up through the field. A chaotic turn saw three crews aiming for the same buoy and colliding which damaged a rigger. This gave out during the return leg, leaving the crew battling home in 5th. 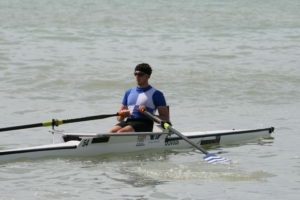 Chris Price, competing in the Men’s Junior Sculls, managed to avoid the capsize of a competitor to be in the mix in the early stages. His challenge fell away by the turn and he came home in the points in 5th place. 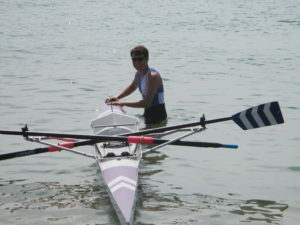 Johnston, competing in the Ladies Sculls, found that the lead two scullers were very strong leaving her to fight for the minor places. 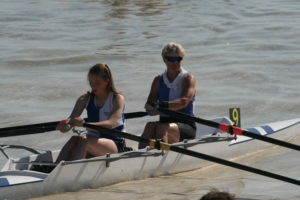 Eventually coming in 5th before jumping into the Senior Ladies Pairs with West-Burrows two races later. The crew, who prefer rougher conditions, found the going tough with the quick turn around taking its toil leaving the boat pushing for the final points for 6th but just missing out. 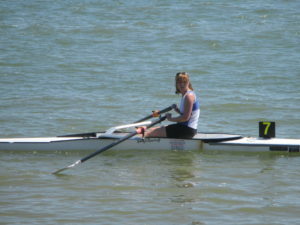 Johnston injured her wrist in the Sculls race on the second day which saw her come home in 7th. 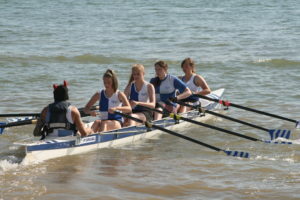 At Bexhill Antonia Reed helped out Herne Bay in the Ladies Novice 4 where the young crew came in 5th.